The Advanced CCD Imaging Spectrometer (ACIS) offers the capability to simultaneously acquire high-resolution images and moderate resolution spectra. The instrument can also be used in conjunction with the High Energy Transmission Grating (HETG) or Low Energy Transmission Grating (LETG) to obtain higher resolution spectra (see Chapters 8 and 9). 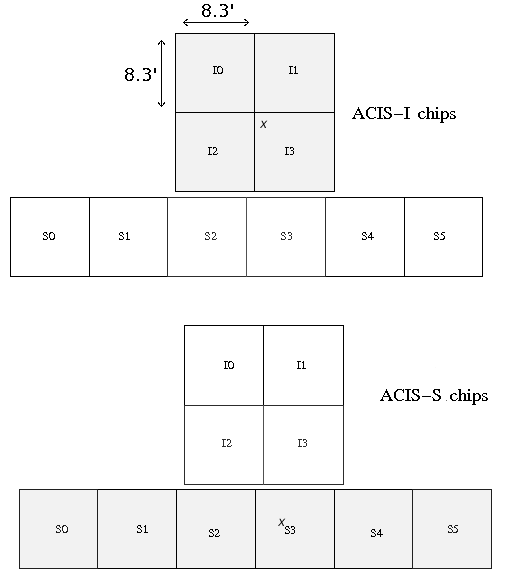 ACIS contains 10 planar, 1024×1024 pixel CCDs (Figure 6.1); four arranged in a 2×2 array (ACIS-I) used for imaging, and six arranged in a 1×6 array (ACIS-S) used either for imaging or for a grating spectrum read-out. Two CCDs are back-illuminated (BI) and eight are front-illuminated (FI). The response of the BI devices extends to energies below that accessible to the FI chips. The chip-average energy resolution of the BI devices is better than that of the FI devices. In principle, any combination of up to 6 CCDs can be operated simultaneously. However, because of changes in the thermal environment, the CXC now recommends that fewer CCDs be selected if the science needs can be met with fewer CCDs. Some CCDs can be designated as optional, which means they may be turned off depending on thermal conditions. See the Section 6.22.1 for more details on CCD selection recommendations and policies. Figure 6.1: A schematic drawing of the ACIS focal plane; insight to the terminology is given in the lower left. Note the aimpoints: on S3 (the `+') and on I3 (the `x'). Note the differences in the orientation of the I and S chips, important when using subarrays (Section 6.13.1). Note also the (Y, Z) coordinate system and the target offset convention (see Chapter 3) as well as the SIM motion (+/−Z). This view is along the optical axis, from the sky toward the detectors, (-X). The numerous ways to refer to a particular CCD are indicated: chip letter+number, chip serial number, and ACIS chip number (CCD_ID); see also Table 6.1. As indicated, S3 and S1 are back-illuminated (BI) CCDs, and the rest are front-illuminated (FI) CCDs. 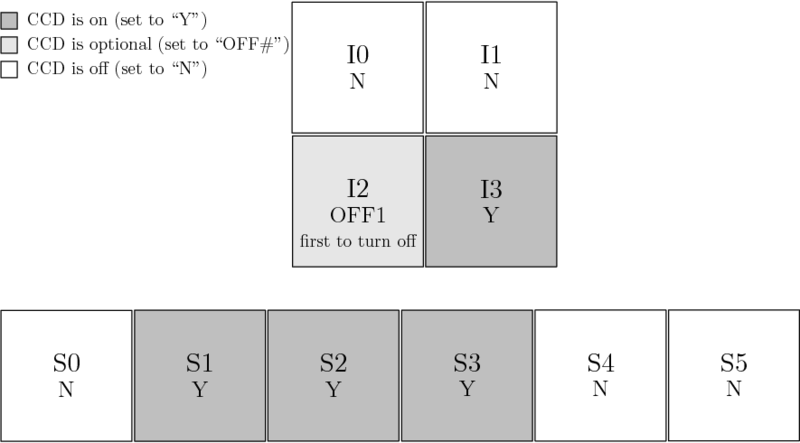 The node numbering scheme and the row/column directions are illustrated lower center. Table 6.1: Naming conventions for the ACIS CCDs. See Figure 6.1 for the positions and orientations in the flight focal plane. Figure 6.2: A schematic drawing of the ACIS focal plane, not to scale. 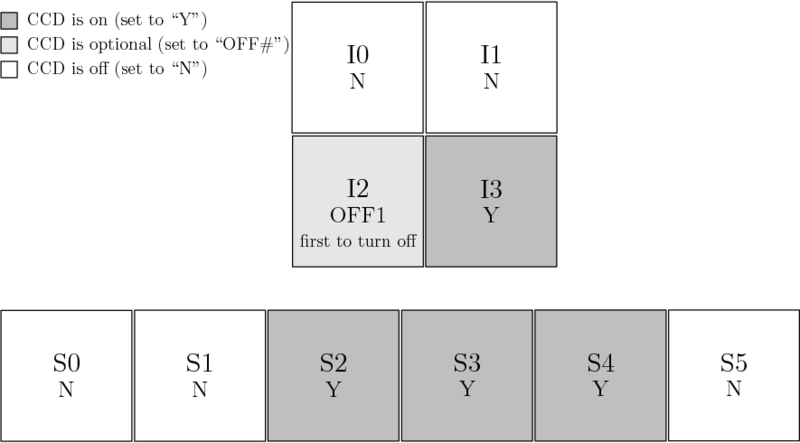 The ACIS-I array consists of chips I0-I3 (shaded gray in the upper figure). The ACIS-S array consists of chips S0-S5 (shaded gray in the lower figure). See the discussion in Section 6.22.1 for information on selecting CCDs. The original Instrument Principal Investigator for ACIS is Prof. Gordon Garmire (Pennsylvania State University, now at Huntingdon Institute for X-ray Astrophysics and Space Research). ACIS was developed by a collaboration between Penn State, the MIT Kavli Institute for Astrophysics and Space Research and the Jet Propulsion Laboratory, and was built by Lockheed Martin and MIT. The MIT effort was led by Dr. George Ricker. The CCDs were developed by MIT 's Lincoln Laboratory. ACIS is a complex instrument having many different characteristics and operating modes. Radiation damage suffered by the FI chips has had a negative impact on their energy resolution - the BI devices were not affected - thus affecting the basic considerations as to how to make best use of the instrument. We discuss the trade-offs in this chapter. Software methods for improving the energy resolution of the FI CCDs are discussed in Section 6.7.1. The low energy response of ACIS has also been affected by the buildup of a contaminant on the optical blocking filters and this is discussed in Section 6.5.1. Many of the characteristics of the ACIS instrument are summarized in Table 6.2. A CCD is a solid-state electronic device composed primarily of silicon. A "gate" structure on one surface defines the pixel boundaries by alternating voltages on three electrodes spanning a pixel. The silicon in the active (depletion) region (the region below the gates wherein most of the absorption takes place) has an applied electric field so that charge moves quickly to the gate surface. 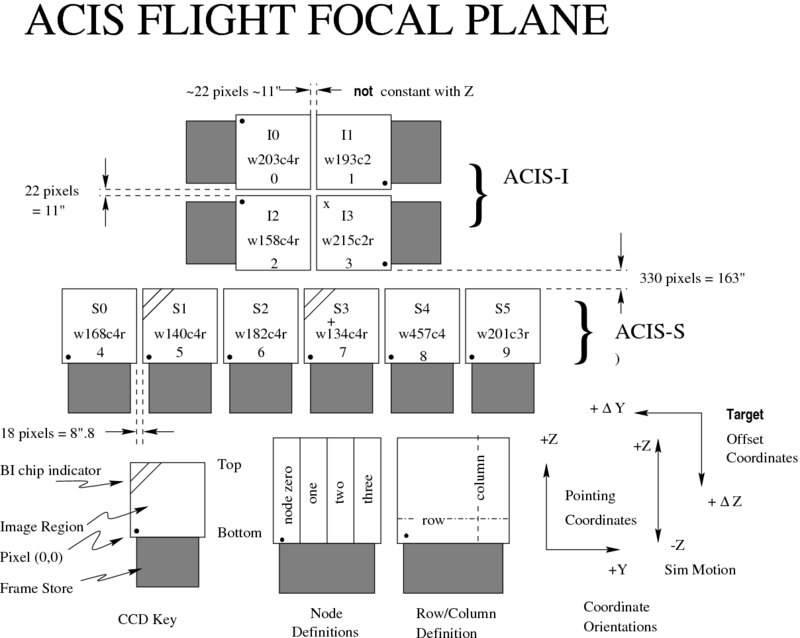 The gates allow confined charge to be passed down a "bucket brigade" (the buried channel) of pixels in parallel to a serial read-out at one edge by appropriately varying ("clocking") the voltages in the gates. The ACIS front-illuminated CCDs have the gate structures facing the incident X-ray beam. Two of the chips on the ACIS-S array (S1 and S3) have had the back sides of the chips treated, removing insensitive, undepleted bulk silicon material and leaving the photo-sensitive depletion region exposed. These are the BI chips and are deployed with the back side facing the HRMA. Photoelectric absorption of an X-ray photon in silicon results in the liberation of a proportional number of electrons: an average of one electron-hole pair for each 3.7 eV of energy absorbed. Immediately after the photoelectric interaction, the charge is confined by electric fields to a small volume near the interaction site. Charge in a FI device can also be liberated below the depletion region, in an inactive substrate, from where it diffuses into the depletion region. This charge may easily appear in two or more pixels. Good spectral resolution depends upon an accurate determination of the total charge deposited by a single photon. This in turn depends upon the fraction of charge collected, the fraction of charge lost in transfer from pixel to pixel during read-out, and the ability of the read-out amplifiers to measure the charge. Spectral resolution also depends on read noise and the off-chip analog processing electronics. The ACIS CCDs have read-out noise less than 2 electrons RMS. Total system noise for the 40 ACIS signal chains (4 nodes/CCD) ranges from 2 to 3 electrons (RMS) and is dominated by the off-chip analog processing electronics. The CCDs have an "active" or imaging section (see Figure 6.1) which is exposed to the incident radiation and a shielded "frame store" region. A typical mode of the ACIS CCD operation is: (1) the active region is exposed for a fixed amount of time (full frame ∼ 3.2 s); (2) at the end of the exposure, the charge in the active region is quickly ( ∼ 41 ms) transferred in parallel into the frame store; (3) the next exposure begins; (4) simultaneously, the data in the frame store region are transferred serially to a local processor which, after removing bias (see Section 6.14), identifies the position and amplitude of any "events" according to a number of criteria depending on the precise operating mode. These criteria always require a local maximum in the charge distribution above the event threshold (see Table 6.2). The position and the amount of charge collected, together with similar data for a limited region containing and surrounding the pixel are classified ("graded") and then passed into the telemetry stream. Since the CCDs are sensitive to optical as well as X-ray photons, optical blocking filters (OBFs) are placed just over the CCDs between the chips and the HRMA. The filters are composed of polyimide (a polycarbonate plastic) sandwiched between two thin layers of aluminum. The nominal thicknesses of these components for the two arrays are given in Table 6.3. Details of the calibration of these filters may be found in the ACIS calibration report at http://www.astro.psu.edu/xray/docs/cal_report/node188.html. These calibrations do not include the more recent effects of molecular contamination. This is discussed in Section 6.5.1. The brightness threshold for optical contamination (here defined as a 1 ADU shift per pixel in the signal) is based on on-orbit calibration observations of two stars: Vega and Betelgeuse. The ratio of the signals leads us to believe that there is a light leak in the I or J band in the near infrared part of the spectrum. The light leak has decreased with time; the most recent observations of Vega and Betelgeuse show a substantial further decrease. We find threshold I and J magnitudes of ∼ −1.0. for S3 and ∼ −2.0 for I3. Brighter stars can be observed, but require special techniques in either data analysis, observation planning, or both. Details can be found on this web page: http://cxc.harvard.edu/cal/Hrma/UvIrPSF.html. The CXC HelpDesk (http://cxc.harvard.edu/helpdesk/) can help with detailed questions. Measurements of ACIS include laboratory calibrations, a system-level ground calibration of the HRMA and ACIS at the X-Ray Calibration Facility (XRCF) at MSFC, and on-orbit calibration using celestial and on-board radioactive X-ray sources. The ACIS external calibration source (ECS) consists of an 55Fe source and a target made of aluminum and titanium. The source emits five strong lines (Al Kα at 1.49 keV, Ti Kα and Kβ, at 4.51 and 4.93 keV, and Mn Kα and Kβ at 5.90 and 6.49 keV). A number of weaker lines are also present. The on-orbit calibration of ACIS is a continuing activity. All calibration data are, or will be, described in detail, at http://cxc.harvard.edu/cal/. Consult the WWW site and its links for the latest information. The quantum efficiencies near the read-out for the ACIS CCDs for the standard grade set, including optical blocking filters and molecular contamination, are shown in Figure 6.3. Note that the quantum efficiency for the FI chips varies somewhat with row number (not shown), and decreases by 5-15% farthest from the read-out at energies above about 4 keV. This is due to the migration of good grades to bad grades produced by charge transfer inefficiency (CTI), which varies with row number. The quantum efficiency (QE) variation with position for the BI chips is much smaller. Cosmic rays tend to cause large blooms on FI chips, and much smaller ones on BI chips. This results in a 2-4% decrement of the QE for FI chips and ∼ 0.5% for BI chips. The combined HRMA/ACIS on-axis effective areas are shown in Figure 6.4 (log energy scale) and 6.5 (linear energy scale). The effective areas are for an on-axis point source and a 20′′-diameter extraction region. The ACIS effective areas include a correction that accounts for the buildup of molecular contamination on the ACIS filters (see the discussion in Section 6.5.1). Figures 6.4 and 6.5 show the predicted ACIS effective areas for the middle of Cycle 21 based on the current time-dependent ACIS contamination models. Figure 6.6 shows the vignetting (defined as the ratio of off-axis to on-axis effective area) as a function of energy at several off-axis angles. These data are from a calibration observation of G21.5-0.9, a bright supernova remnant/pulsar wind nebula. The detector was appropriately offset for each off-axis angle so that the data were obtained at the same focal position, minimizing the effects of any spatially-dependent variations in the CCD response. Figure 6.3: The quantum efficiency (convolved with the transmission of the appropriate optical blocking filter) of the FI CCDs (from a row nearest the read-out) and the two BI CCDs as a function of energy. S3 is somewhat thicker, hence more efficient, than S1. These curves include the effects of molecular contamination, as discussed in the text. Figure 6.4: The HRMA/ACIS predicted effective area versus the energy on a log scale. The dashed line is for the FI CCD I3, and the solid line is for the BI CCD S3. These curves include the effects of molecular contamination, as discussed in the text. Figure 6.5: The HRMA/ACIS predicted effective area versus the energy on a linear scale. 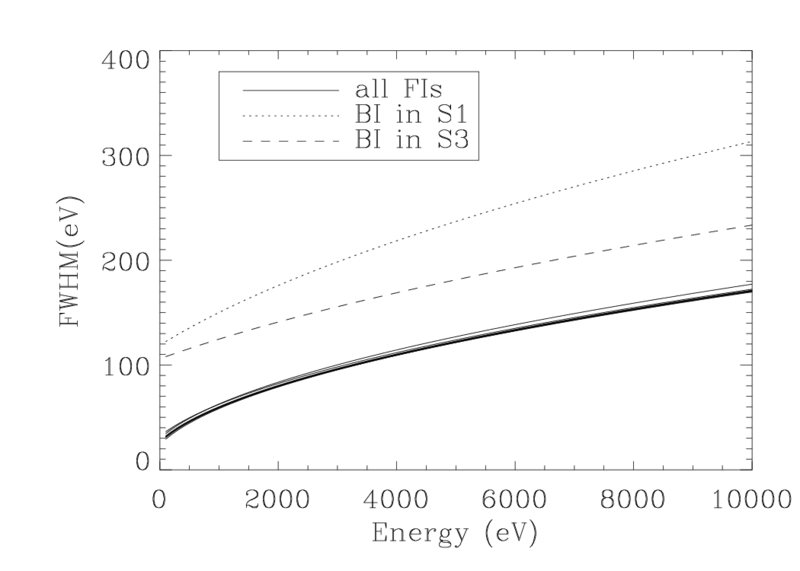 The dashed line is for the FI CCD I3, and the solid line is for the BI CCD S3. These curves include the effects of molecular contamination, as discussed in the text. Figure 6.6: Vignetting (the ratio of off-axis to on-axis effective area) as a function of energy for several off-axis angles in arcmin. Astronomical observations and data acquired from the on-board ACIS external calibration source (ECS) show that the ACIS effective area below 2 keV has continuously declined since launch due to the build-up of out-gassed material on the cold ACIS optical blocking filters. The HRC operates at a warmer temperature and shows no sign of contamination build-up. The build-up of contaminant on the ACIS filters has been monitored with ECS observations, LETG/ACIS-S observations of the blazars Mkn421 and PKS2155-304 and the isolated neutron star RXJ1856-3754, and ACIS imaging observations of the rich cluster of galaxies Abell 1795 and the oxygen-rich supernova remnant E0102-72.3. The ECS is an 55Fe source with a half-life of 2.7 years and is no longer useful for monitoring the contamination on the ACIS filter. Figure 6.7: Optical depth of the contaminant measured at 0.66 keV from observations of the galaxy cluster Abell 1795. Red squares denote observations with the target on ACIS-S and blue disks denote observations with the target on ACIS-I. The solid curve shows the best-fit relation to the data. Typically the calibration team releases updates to the contamination model near the end of each calender year. The update accounts for any changes in the characteristics of the contamination as measured by observations taken over the same calender year. Most updates do not affect the analysis of data taken prior to that calender year. The contamination model is distributed as part of the CALDB, and is described at: http://cxc.harvard.edu/ciao/why/acisqecontamN0011.html There are three components to the ACIS contamination model: 1) the build-up rate of the contaminant on the ACIS filters, 2) the spatial distribution of the contaminant on the ACIS filters, and 3) the chemical composition of the contaminant and hence its energy-dependent effects. The energy-dependent effect is largest near the Carbon edge at 0.277 keV and is negligible beyond ∼ 1-2 keV. Figures 6.7-6.9 show that all three of these properties concerning the contaminant have changed significantly during the Chandra mission. Figure 6.7 shows that the optical depth of the contaminant appeared to be leveling off prior to about 2009, at which time the condensation rate of the contaminant onto the ACIS filter began increasing. Also, before 2014, the depth of the contaminant near the ACIS-S and ACIS-I aim-points was approximately the same. Since 2014 the observations of A1795 show that the depth of the contaminant is greater on the ACIS-I filter compared to the ACIS-S filter. Recent observations suggest that the thickness of the contaminant on the ACIS-I filter may be leveling off, implying that the rate of deposition of the contaminant on the ACIS-I filter has significantly decreased since 2017 (see Figure 6.7). Figure 6.8: The difference between the optical depth at 0.66 keV measured near the center of the ACIS-S chip S3 and that measured near the readout at the edge of the same chip is shown against time. Black circles are measurements made using the ECS data and red squares are made from observations of the galaxy cluster Abell 1795. The solid curve is the best-fit relation to the data. In addition, the contaminant has always been thicker near the edges of the filters. Figure 6.8 shows the difference in the optical depth on the filter measured near the center of the chip and near the edge. The difference in optical depth appeared to be leveling off prior to 2009, but has steadily increased from 2009 until 2015. Since 2015 the difference in optical depth has been leveling off, indicating a more uniform deposition on the filters. The data for the edge of the chip are taken at CHIPY=64 (near the readout) for ACIS-S. On ACIS-I the spatial variations are similar to those on ACIS-S with more contaminant on the outer edges of the array. LETG/ACIS-S observations show that the contaminant is composed of carbon, oxygen and fluorine. Figure 6.9 shows that the oxygen-to-carbon ratio of the material condensing onto the ACIS filters has varied significantly during the mission indicating the presence of several different contaminants which have dominated the condensation rate onto the ACIS filters at different times. To assist with the proposal process, PIMMS tables are generated for the ACIS effective area based on an extrapolation of the current contamination model to the middle of the next Cycle, which is an extrapolation of approximately 18 months. Based on recent changes in the behavior of the out-gassed material condensing onto the ACIS filters, proposers are advised to include an uncertainty of about 10% in the predicted ACIS on-axis count rates below about 1 keV, and about 20% near the chip edge. 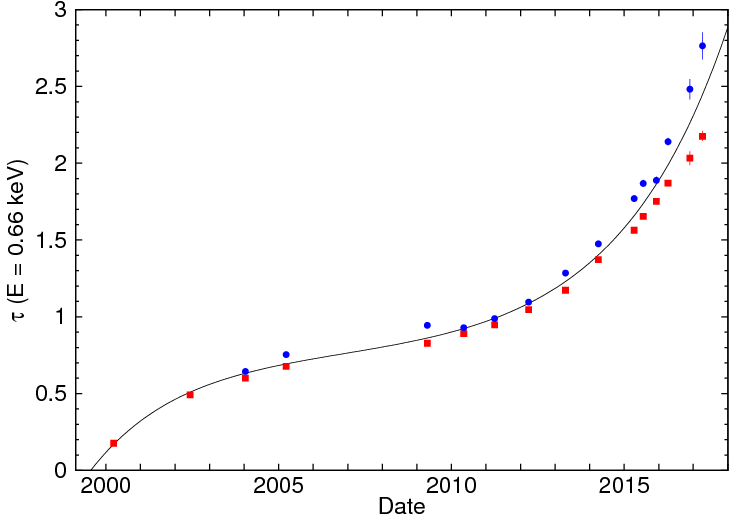 Figure 6.9: The ratio of the deposition rate in oxygen atoms per year to that for carbon over the Chandra mission as measured by LETG/ACIS-S observations of blazars. The spatial resolution for on-axis imaging with HRMA/ACIS is limited by the physical size of the CCD pixels (24.0 μm square ∼ 0.492 arcsec) and not the HRMA. This limitation applies regardless of whether the aimpoint is selected to be the default aimpoint on I3 or S3 (Figure 6.1). Approximately 90% of the encircled energy lies within 4 pixels (2 arcsec) of the center pixel at 1.49 keV and within 5 pixels (2.5 arcsec) at 6.4 keV. Figure 6.10 shows an in-flight calibration. There is no evidence for any differences in data taken with either S3 or I3 at the nominal focus. The ACIS encircled energy as a function of off-axis angle is discussed in Chapter 4 (see Section 4.2.2 and Figure 4.13). Off-axis, the departure of the CCD layout from the ideal focal surface and the increase of the HRMA PSF with off-axis angle become dominating factors. Since the ideal focal surface depends on energy, observers for whom such considerations may be important are urged to make use of the MARX simulator to study the impact on their observation. Figure 6.10: The on-orbit encircled broad-band energy versus radius for an ACIS observation of point source PG1634-706 (ObsID 1269). The curve is normalized to unity at a radius of 5 arcsec. We estimate that the statistical uncertainty is 3%, and the systematic uncertainty due to power beyond 5′′ is 2%. The effective energy is 1 keV. The Chandra PSF near the aimpoint displays an unexplained enhancement in the profile ≈ 0.8" from the source centroid (see Section 4.2.3). This anomaly is in excess of that expected from ray trace simulations, and is preferentially oriented towards the mirror spherical coordinate (MSC) angle of φ = 285° (see the CIAO caveats page http://cxc.harvard.edu/ciao/caveats/psf_artifact.html). This is approximately oriented towards the spacecraft +Z axis (see Figure 1.2). The asymmetry is illustrated for an ACIS observation of an LMXB in NGC 6397 in Figure 4.17, and the magnitude of the asymmetry is illustrated for a number of low-count-rate on-axis point sources in Figure 4.18 (see Section 4.2.3). 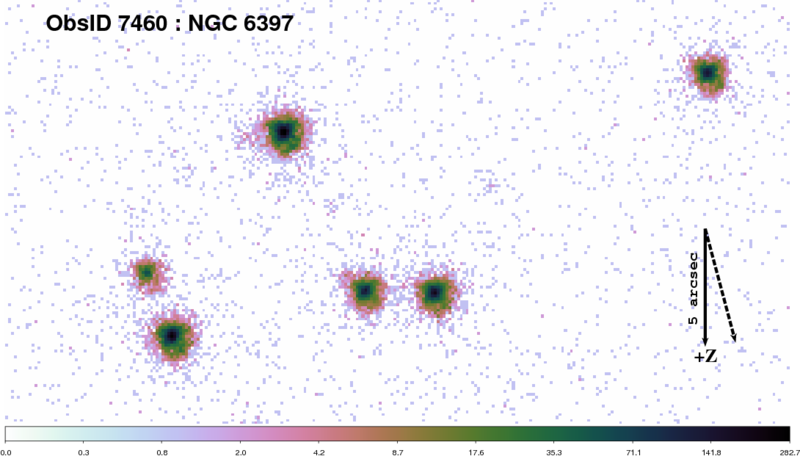 Figure 6.11 depicts the effect of the anomaly on a number of point sources in NGC 6397. Figure 6.11: The PSF anomaly illustrated with an ACIS-S observation of NGC 6397 for a number of sources near the aimpoint. The image has been derolled such that the spacecraft +Z is pointed downwards (see solid vertical downward arrow of length 5"). The nominal direction of the anomaly is indicated by the dashed arrow (also of length 5"). The data have been binned to 1/4 ×1/4 ACIS sky pixels, and a logarithmic intensity stretch has been applied. Notice that all the sources in the field have discernible asymmetries in the indicated direction. The ACIS FI CCDs originally approached the theoretical limit for the energy resolution at almost all energies, while the BI CCDs exhibited poorer resolution. The pre-launch energy resolution as a function of energy is shown in Figure 6.12. Subsequent to launch and orbital activation, the energy resolution of the FI CCDs has become a function of the row number, being near pre-launch values close to the frame store region and substantially degraded in the farthest row. An illustration of the dependence on row is shown in Figure 6.13. Figure 6.12: The ACIS pre-launch energy resolution as a function of energy. The loss of energy resolution is due to increased charge transfer inefficiency (CTI) caused by low energy protons encountered during radiation belt passages and Rutherford scattering through the X-ray telescope onto the focal plane. Subsequent to the discovery of the degradation, operational procedures were changed: ACIS is moved to a sheltered position during radiation belt passages. Since this procedure was initiated, no further degradation in performance has been encountered beyond that predicted from pre-launch models. The BI CCDs were not impacted, which is consistent with the proton-damage scenario - it is far more difficult for low-energy protons from the direction of the HRMA to deposit their energy in the buried channels of the BI devices, since the channels are near the gates and the gates face in the direction opposite to the HRMA. Thus the energy resolution for the two BI devices remains nearly at pre-launch values. The position-dependent energy resolution of the FI CCDs depends significantly on the ACIS focal plane (FP) temperature. 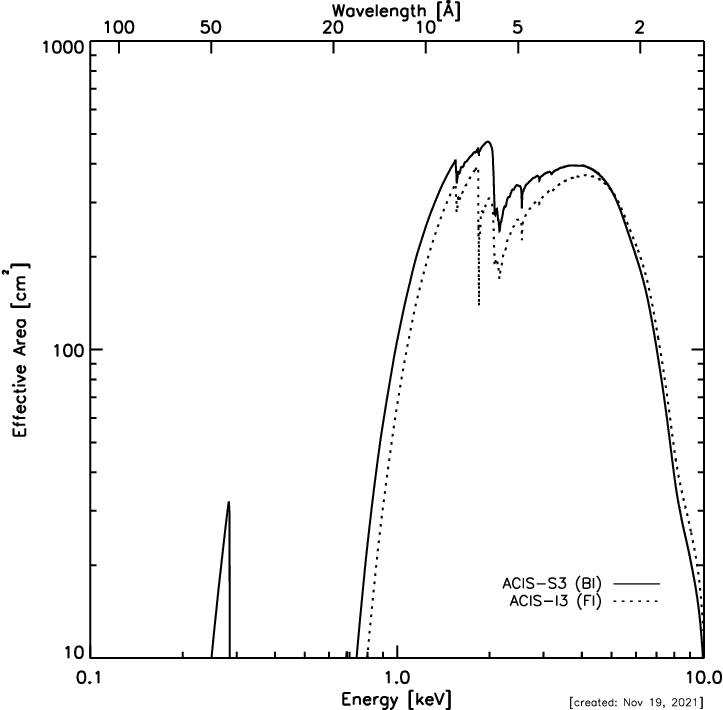 Since orbital activation, the ACIS FP temperature has been lowered in steps and is now set at ∼ −120°C. As discussed in Section 6.20, the FP temperature will warm above −120°C for long observations (t > 50 ks) if the spacecraft pitch angle is larger than 130°. If the optimal spectral performance is important for the scientific goals, the observer should consider operating as few CCDs as possible to minimize the FP temperature (see Section 6.22 for details on specifying the configuration). The ACIS instrument team has developed a correction algorithm that recovers much of the lost energy resolution the FI CCDs. The correction recovers a significant fraction of the CTI-induced loss of spectral resolution of the FI CCDs at all energies. The algorithm has been incorporated in the CIAO tool acis_process_events since CIAO 2.3. Figure 6.13 illustrates the improvement that the tool provides. As of 2006-Dec, data for the two BI chips can also be corrected in the same way, including a correction for serial CTI for the BI chips, though the effects are more subtle. The resulting response is very nearly uniform across the BI chips once this correction is made. As of December 15 2010 (CIAO 4.3), temperature dependence was added to the CTI correction in acis_process_events for both FI and BI CCDs. Figure 6.13: We plot energy resolution (FWHM in eV) versus row number (CHIPY) for several cases. At the top, we show Aluminum Kα (1.49 keV), while the bottom plot is for Manganese Kα (5.9 keV). In each panel, the data points represent the response of the I3 chip (upper curve, without CTI correction; lower curve, with CTI correction), while the lines represent the response of S3. Data were taken from 2009-May through 2009-Jul, on I3 node 3, and S3 node 0 (where the aimpoints are). The ACIS energy resolution (here taken to mean the full width at half maximum [FWHM] of a narrow spectral line) varies roughly as the square root of the energy, and increases with distance from the read-out. 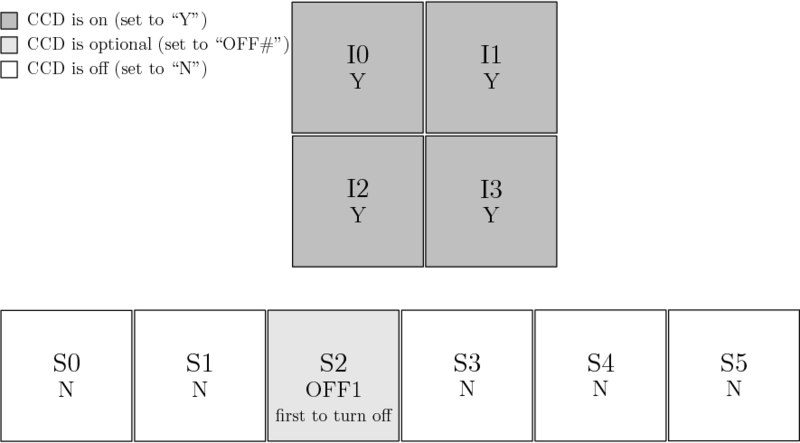 On FI chips (the I array and all the S array chips except S1 and S3), the increase with CHIPY (row number) is dramatic, as can be seen in Figure 6.13. The spatial dependence on BI chips (S1 and S3) is much weaker, but depends on both coordinates. To illustrate, we have measured the resolution at the aimpoints and default offsets in effect 2009 (see Table 6.4), using the aluminum (1.49 keV) and manganese (5.9 keV) Kα lines in the external calibration source. Data were summed over three months in the summer of 2009, and over an area of 32×32 pixels. Note that these values are intended to be illustrative; the spectral resolutions at the aimpoints will differ from those in Table 6.4 because the 2009 aimpoints plus default offsets differ slightly from the default aimpoints established for Cycle 18 and beyond; see Section 4.5 for more detail. 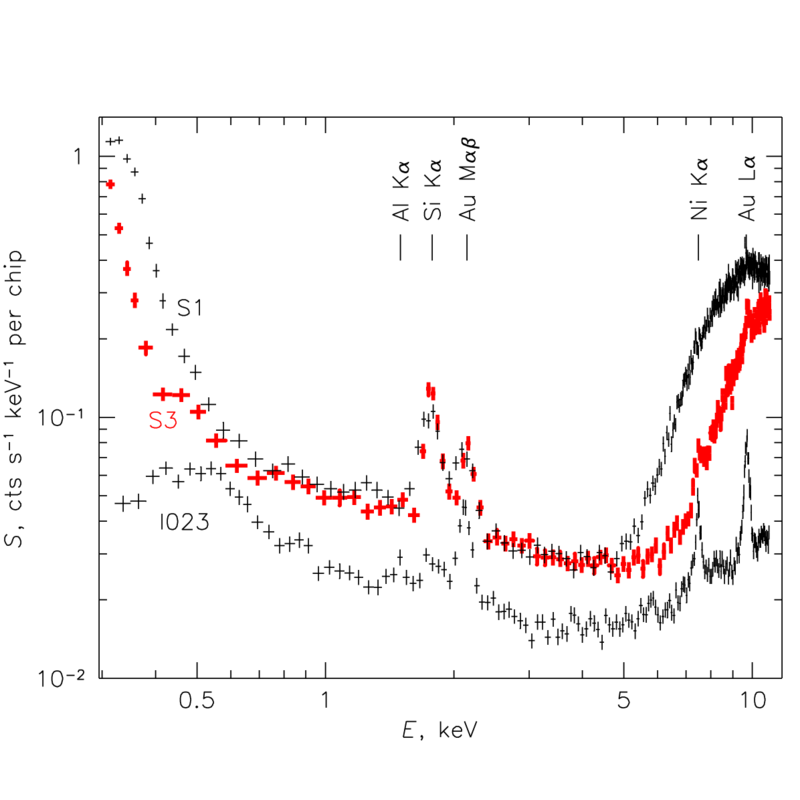 For CCD detectors, the gain is the relation between the energy of the incident photon and the magnitude of the collected charge (digitized to ADU). CTI both broadens the detector response and (because charge is lost to CTI effects) reduces the charge recorded. CTI depends on the CCD type (FI or BI) and on row number, thus inducing a spatially-dependent gain effect. To account for the spatial variation of the response, the response width and gain were calibrated for 256×32 [CHIPX,CHIPY] "tiles" for FI chips, and 32×32 tiles for BI chips. A time dependent CTI correction (see Section 6.7.1) and corresponding gain calibrations were developed based on an initial "epoch" of external calibration source (ECS) data taken between February and April, 2000. The CTI evolution is monitored with regular observations of the ECS. Correction of the CTI broadening accounts for most of the gain shift, however residual changes remain. These residual changes are calibrated by collecting ECS data for three month intervals ("epochs") and fitting to the prominent spectral lines in the ECS data covering ∼ 1.5 keV to ∼ 6 keV, to obtain the time-dependent gain ("t_gain"). Because the ECS has been fading, longer collection intervals (initially 6 months) will now be used. 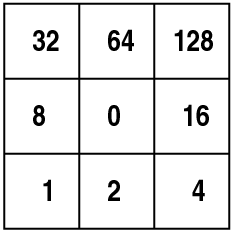 The t_gain corrections are evaluated for 32×32 tiles for all chips except S1, which uses 64×64 tiles. Two of the CCDs (I0, and I2) show instrumental noise affecting the gain ("anomalous" gain) on shorter intervals than are captured by the periodic t_gain updates, so the gain (including the time-dependent gain correction) may be somewhat less accurate for these chips than for the other CCDs. The FI detectors show a "mid-chip gain droop", in which the conversion from PHA to energy produces energies which are too small in the 32×32 pixel (CHIPX, CHIPY) regions immediately adjacent to the node boundary at CHIPX 512, 513. The deficit is particularly prominent at low energies (see Fig. 6.14 for an example). The effect is independent of time. This is currently under investigation, in preparation for updating response products to correct for this droop. Until it is corrected in the calibration products, observers should avoid placing sources requiring accurate energy determination (for example, sources where spectral line energies are important) within ±32 pixels of the node 1, node 2 boundary at chipx = 512,513 on FI CCDs. Figure 6.14: Example of the "gain droop" phenomenon seen on FI chips. 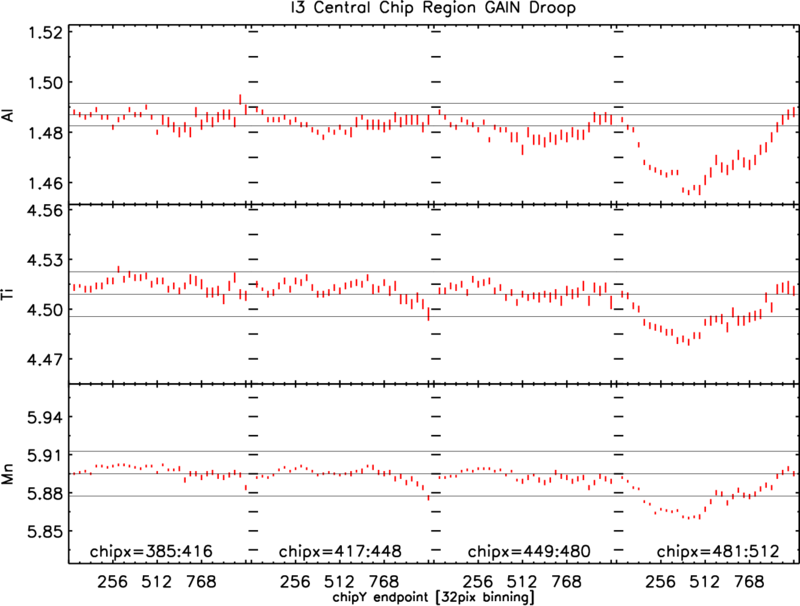 The energies for three calibration lines are plotted vs CHIPY (32-pixel binning) for four 32-pixel wide (CHIPX) regions adjacent to the node boundary at CHIPX 512, 513. Hot pixels and columns are defined to be those which produce a spuriously high or saturated pulse-height for a large number of consecutive frames of data. These depend on operating conditions such as temperature. One should always refer to the CXC web site for the most recent list. Cosmic ray hits sometimes deposit so much charge that they appear in the same pixels for a number of successive (or nearly successive) frames. These cosmic ray afterglows are essentially temporary hot pixels, and are removed by the hot pixel logic if they contain more than approximately 8 events. Aimpoints are the nominal positions on ACIS where the flux from a point source with no target offset or SIM-Z translation is placed. There are two aimpoints, indicated in Figure 6.1 - one on the corner of I3 on the ACIS-I array (the ACIS-I aimpoint), and one near the boundary between nodes 0 and 1 on S3 of the ACIS-S array (the ACIS-S aimpoint). Because of variations in the thermal conditions in the aspect subsystem (see Section 5.4.3), the actual position on the detector of a source with no offsets or SIM-Z translations can vary somewhat from the default location. Note also spacecraft dither will move the position of the source on the detector in a Lissajous pattern centered on the source position on the detector (see Section 6.12). As of Cycle 18, permanent default aimpoints are specified for each detector. Note that the aimpoint is not the same as the optical axis, which is defined as the position of the narrowest PSF. The chip coordinates of the aimpoints and the current estimate for the optical axis position are listed in Table 4.3. The aimpoints are close to the optical axis, and have been adjusted to reduce the risk of dither moving a source at the default aimpoint across a chip edge (ACIS-I3) or across a node boundary (ACIS-S3) with the expected aiming uncertainties. Figures 4.26 and 4.27 show the default aimpoints, aimpoint error box, and aimpoint error box plus dither. Further information on the absolute pointing and aimpoint stability and uncertainties can be found in Sections 5.4.3 and 4.5. Approximate contours of constant encircled energy for ACIS-I and ACIS-S observations at the aimpoints are shown in Figures 6.15 and 6.16. When ACIS is used with one of the transmission gratings, HETG, or LETG, a SIM translation may be applied, and offsets may be applied to the default aimpoints used for non-grating observations. For further details, see Chapter 8 (HETG), or Chapter 9 (LETG). Figure 6.15: Approximate contours of constant 50% encircled energy at 1.49 keV when the ACIS-I aimpoint is selected. The dotted line is 1 arcsec, the dashed line is 1.5 arcsec. The remainder are at 1 arcsec intervals. The thicker solid lines highlight the 5, 10, and 15 arcsec contours. Figure 6.16: Approximate contours of constant 50% encircled energy at 1.49 keV when the ACIS-S aimpoint is selected. The dotted line is 1 arcsec, the dashed line is 1.5 arcsec. The remainder are at 1 arcsec intervals. The thicker solid lines highlight the 5, 10, 15 and 20 arcsec contours. Lastly, it should be kept in mind that for ACIS observations the observatory is typically dithered with a 16′′ peak-to-peak amplitude in the Y and Z directions (see Section 6.12). Unless specially requested, the spacecraft is dithered in a Lissajous pattern during all observations. For observations with ACIS, the default dither pattern spans 16 arcsec peak to peak in both the Y and Z directions. The dither serves two purposes: (1) to provide some exposure in the gaps between the CCDs, and (2) to smooth out pixel-to-pixel variations in the response. The effect of dither is removed during high-level ground processing of the data. The exposure time in the gaps between chips (and at the outside edges) will be less than that for the remainder of the field. Default dither parameters are listed in Table 5.4. The approximate sizes of the various gaps between chips are shown in Figure 6.1. Note that due to the way the ACIS-I array CCDs are tilted to follow approximately the HRMA focal plane curvature, the Y-gaps vary slightly with Z and the Z-gaps vary slightly with Y.
ACIS has two operating modes: the Timed Exposure (TE) Mode, and the Continuous Clocking (CC) Mode. One must select one or the other for an observation as it is not possible to simultaneously operate individual CCDs in different modes during a single observation. A timed exposure refers to the mode of operation wherein a CCD collects data (integrates) for a preselected amount of time - the Frame Time. Once this time interval has passed, the charge from the 1024×1024 active region is quickly ( ∼ 41 ms) transferred to the frame store region and subsequently read out through (nominally) 1024 serial registers. Frame times are selectable within a range of values spanning the time interval from 0.2 to 10.0 sec. If the data from the entire CCD are utilized (full frame) then the nominal (and optimal!) frame time, Topt, is 3.2 s. Selecting a frame time shorter than the nominal value (e.g. to decrease the probability of pile-up - Section 6.16) has the consequence that there will be a time during which no data are taken, "deadtime", as 3.2 s are required for the frame store read-out process regardless of the frame time. The fraction of time during which data are taken is simply the ratio of the selected frame time to the sum of the nominal frame time and the 41 msec transfer time - e.g. for a new frame time of t ( < 3.2) secs, the fraction of time during which data are taken is t/(Topt+0.041). We note, strictly speaking, the full-frame time depends on how many CCDs are on - see the equation below - but the differences are very small. Finally, we note that selecting a frame time longer than the most efficient value increases the probability of pile-up occurring and is not recommended. In addition, with the standard ACIS dither, a frame time longer than 3.2 s will add a blur to the PSF. T(msec) = 41.12×m + 0.040 ×(m×q) + 2.85×n − 32.99. As with full frames, selecting a frame time less than the most efficient value results in loss of observing efficiency. Frame times are rounded up to the nearest 0.1 sec, and can range from 0.2 to 10.0 sec. When operating with only one chip, subarrays as small as 100 rows are allowed (this permits 0.3 sec frame times which pay no penalty in dead time if q ≤ 200. Use the above equation to determine what the most efficient frame time is for your desired ACIS configuration. For multichip observations, the smallest allowed number of rows is 128. For small subarrays, the aiming uncertainties plus dither should be taken into account; see Section 6.11 and references therein. Figure 6.17: Examples of various subarrays. The heavy dot in the lower left indicates the origin. It takes 40 μsec to transfer the charge from one row to another during the process of moving the charge from the active region to the frame store region. This has the interesting consequence that each CCD pixel is exposed not only to the region of the sky at which the observatory was pointing during the long (frame time) integration, but also, for 40 μsec each, to every other region in the sky along the column in which the pixel in question resides. Figure 6.18 is an example where there are bright features present so intense that the core of the PSF is suppressed because of pile-up (see Section 6.16), allowing the tiny contribution of the flux due to trailing to be stronger than the (piled-up) core of the direct exposure - hence the trailed image is clearly visible. Trailed images are also referred to as "read out artifacts", "transfer smear", or "out-of-time images". The user needs to be aware of this phenomenon as it has implications for the data analysis, including estimates of the background. In some cases, the trailed image can be used to obtain an unpiled spectrum and can also be used to perform 40 microsec timing analysis of (extremely bright) sources. Figure 6.18: Trailed image of a strong X-ray source. The core of the image is faint due to pile-up. Most events here are rejected because of bad grades. The read-out direction is parallel to the trail. In some instances, it is desirable to have both long and short frame times. If the exposure time is made very short, pile-up may be reduced, but the efficiency of the observation is greatly reduced by the need to wait for the full 3.2 sec (if six chips are clocked) for the frame-store array processing. With alternating exposure times, all CCDs are clocked in unison, but have two exposure times. One (typically short) primary exposure of length 0.2 < tp < 10.0 sec is followed by k standard exposures ts (for example, 3.2 sec if six chips are clocked). Permissible values of k range from 1 to 15. The short exposures are used to reduce photon pile-up, and the long exposures are useful for studying the fainter objects in the field of view. For example, a typical choice of long and short exposure times might be 3.2 and 0.3 sec. If k = 3, ACIS would perform one 0.3 sec exposure, followed by three exposures of 3.2 sec, repeating until the total observing time expires. for tp < 3.2 sec and ts ≥ 3.2 sec. The continuous clocking mode is provided to allow 3 msec timing at the expense of one dimension of spatial resolution. In this mode, one obtains 1 pixel × 1024 pixel images, each with an integration time of 2.85 msec. Details as to the spatial distribution in the columns are lost - other than that the event originated in the sky along the line determined by the length of the column. In the continuous clocking mode, data are continuously clocked through the CCD and frame store. The instrument software accumulates data into a buffer until a virtual detector of size 1024 columns by 512 rows is filled. The event finding algorithm is applied to the data in this virtual detector and 3×3 event islands are located and recorded to telemetry in the usual manner (Section 6.15.1). This procedure has the advantage that the event islands are functionally equivalent to data accumulated in TE mode, hence differences in the calibration are minimal. The row coordinate (called CHIPY in the FITS file) maps into time in that a new row is read from the frame store to the buffer every 2.85 msec. This does have some minor impacts on the data. For example, since the event-finding algorithm is looking for a local maximum centered in a 3×3 pixel area, it cannot find events on the edges of the virtual detector. Hence, CHIPX cannot be 1 or 1024, and CHIPY cannot be 1 or 512. In other words, events cannot occur at certain times separated by 512*2.85 msec or 1.4592 sec. Likewise, it is impossible for two events to occur in the same column in adjacent time bins. Event files for continuous-clocking mode data contain two time columns, TIME, and TIME_RO. The TIME_RO records the read-out times (effectively the time the virtual frame is processed to identify events). The TIME column is an estimate of the photon time of arrival at the detector, based on the read-out time, the aspect solution, and the specified sky location of the source. See the acis_process_events documentation for information on the generation of these columns. In order to ensure that the TIMEs are as accurate as possible, it is best to specify the source location to better than 0.5′′. The read-out time can differ from the arrival time by about 2.9 to 5.8 s, depending on the nominal location of the source on the CCD and the dither of the spacecraft. In general, the CCD bias, the amplitude of the charge in each pixel in the absence of external radiation, is determined at every change of instrumental parameters or setup when ACIS is in place at the focus of the telescope. These bias maps have proven to be remarkably stable and are automatically applied in routine data processing. The bias maps for continuous-clocking mode observations can be corrupted by cosmic rays. If a cosmic ray deposits a lot of charge in most of the pixels in one or more adjacent columns, the bias values assigned to these columns will be too large. As a result, some low-energy events that would have been telemetered will not be telemetered because they do not satisfy the minimum pulse height criterion and the spectrum of a source in the affected columns will be skewed to lower energies. The BI CCDs are relatively insensitive to the problem. A bias algorithm was implemented in Cycle 6 to mitigate the problem. Occasionally a cosmic ray produces an artifact in a bias map. The pipelines search for these artifacts, and, when found, replace the bias map with another from the same epoch. Work is in progress to use long-term average bias maps, either when there are artifacts in the observation-specific bias map, or for all observations. In the first step in detecting X-ray events, the on-board processing examines every pixel in the full bias-subtracted CCD image (even in the continuous clocking mode (Section 6.13.3)) and selects as events those with values that both exceed the event threshold and are greater than all of their touching or neighboring pixels (i.e., a local maximum in a 3×3 pixel detection island). The pixel pattern, and thus the event grade, is determined by which of the outer pixels in a 3×3 grid centered on the initial pixel have values above the split-event threshold. Depending on the grade, the data are then included in the telemetry. On-board suppression of certain grades is used to limit the telemetry bandwidth devoted to background events (see Section 6.17.1). The grade of an event is thus a code that identifies which pixels within the 3×3 pixel island, centered on the local charge maximum, are above certain amplitude thresholds. The thresholds are listed in Table 6.2. Note that the local maximum threshold differs for the FI and the BI CCDs. A "Rosetta Stone" to help one understand the ACIS grade assignments is shown in Figure 6.19, and the relationship to the ASCA grading scheme is given in Table 6.6. Figure 6.19: Schematic for determining the grade of an event. The grade is determined by summing the numbers for those pixels that are above their thresholds. For example, an event that caused all pixels to exceed their threshold is grade 255. A single pixel event is grade 0. It is important to understand that most, if not all, calibrations of ACIS are based on a specific subset of ACIS grades. This standard set comprises ASCA grades 0,2,3,4, and 6 - G(02346). In the absence of pile-up, this particular grade selection appears to optimize the signal-to-background ratio, but this conclusion depends on the detailed spectral properties of the source. Further, most of the scientifically important characteristics of ACIS (effective area, sensitivity, point spread function, energy resolution, etc.) are grade- and energy-dependent. There are a number of telemetry formats available. Specifying a format determines the type of information that is included in the telemetry stream. The number of bits per event depends on which mode and which format is selected. The number of bits per event, in turn, determines the event rate at which the telemetry will saturate and data will be lost until the on-board buffer empties. The formats available depend on which mode (Timed Exposure or Continuous Clocking) is used. The modes, associated formats, and approximate event rates at which the telemetry saturates and one begins to limit the return of data, are listed in Table 6.7. The formats are described in the following paragraphs. Event "arrival time" is given relative to the beginning of the exposure. Faint format provides the event position in detector coordinates, an arrival time, an event amplitude, and the amplitude of the signal in each pixel in the 3×3 event island that determines the event grade. The bias map is telemetered separately. Note that certain grades may be not be included in the data stream (Section 6.17.1). Graded format provides event position in detector coordinates, an event amplitude, the arrival time, and the event grade. Note that certain grades may be not be included in the data stream (Section 6.17.1). Very Faint format provides the event position in detector coordinates, the event amplitude, an arrival time, and the pixel values in a 5×5 island. As noted in Table 6.7, this format is only available with the Timed Exposure mode. Events are still graded by the contents of the central 3×3 island. Note that certain grades may be not be included in the data stream (Section 6.17.1). This format offers the advantage of reduced background after ground processing (see Section 6.17.2) but only for sources with low counting rates that avoid both telemetry saturation and pulse pile-up. Studies (see http://cxc.harvard.edu/cal/Acis/Cal_prods/vfbkgrnd) of the ACIS background have shown that for weak or extended sources, a significant reduction of background at low and high energies may be made by using the information from 5×5 pixel islands, i.e. very faint mode, instead of the faint mode 3×3 island. This screening results in a 1-2% loss of good events. CIAO 2.2 and later provides a tool to utilize the VF mode for screening background events. Please note that the RMF generation is the same for very faint mode as it is for faint mode. See the "Why Topic" http://cxc.harvard.edu/ciao/why/aciscleanvf.html. The very faint mode screening also reduces the nonuniformity of the non-X-ray background (see Section 6.17.1). It is important to realize that VF mode uses more telemetry; the limit is ∼ 68 cts/s, which includes the target flux and the full background from all chips. Check the calibration web page (http://cxc.harvard.edu/cal/Acis/Cal_prods/bkgrnd/current/background.html) for a discussion of background flares and the telemetry limit. In particular, review Section 1.3 of the memo "General discussion of the quiescent and flare components of the ACIS background" by M. Markevitch. To reduce the total background rate and the likelihood of telemetry saturation, VF observations should consider using no more than 4 CCDs and an energy filter with a 12 keV upper cutoff. Starting with Cycle 11, the default upper energy cutoff has been decreased from 15 keV to 13 keV, but VF mode observers should consider reducing this threshold further to 12 keV. If the target is brighter than 5-10 cts/s, one has to take more drastic steps, such as turning off more chips or using Faint mode. See Section 6.22.1 for more information on selection of required and optional CCDs. This mode should not be used for observing bright sources (see the discussion at the end of Section 6.17.1 for more detail). Pile-Up results when two or more photons are detected as a single event. The fundamental impacts of pile-up are: (1) a distortion of the energy spectrum - the apparent energy is approximately the sum of two (or more) energies; and (2) an underestimate as to the correct counting rate - two or more events are counted as one. A simple illustration of the effects of pile-up is given in Figure 6.20. There are other, somewhat more subtle, impacts discussed below (Section 6.16.1). The degree to which a source will be piled can be roughly estimated using PIMMS. Somewhat more quantitative estimates can be obtained using the pile-up models in XSPEC, Sherpa and ISIS . If the resulting degree of pile-up appears to be unacceptable given the objectives, then the proposer should employ some form of pile-up mitigation (Section 6.16.3) as part of the observing strategy. In general, pile-up should not be a problem in the observation of extended objects, the Crab Nebula being a notable exception, unless the source has bright knots or filaments. Figure 6.20: The effects of pile-up at 1.49 keV (Al Kα) as a function of source intensity. Data were taken during HRMA-ACIS system level calibration at the XRCF. 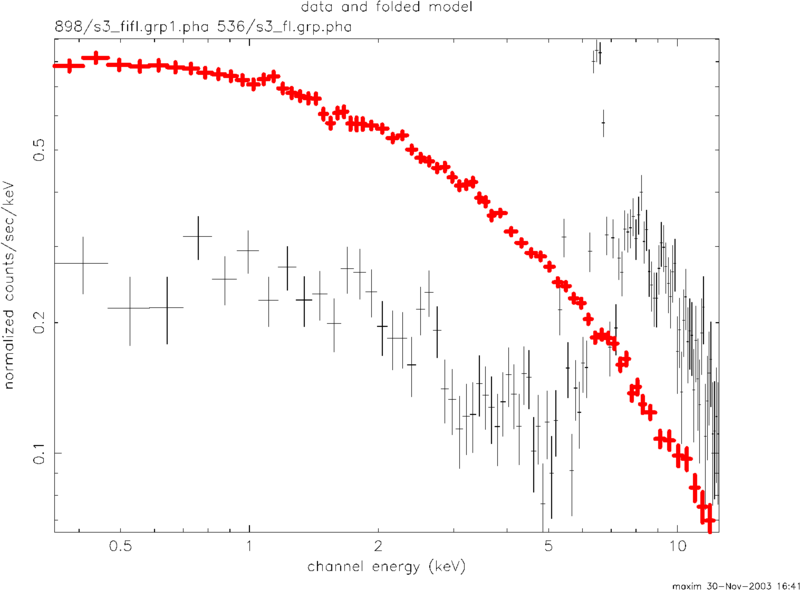 Single-photon events are concentrated near the pulse height corresponding to the Al Kα line ( ∼ 380 ADU), and events with 2 or more photons appear at integral multiples of the line energy. There are other consequences of pile-up in addition to the two principal features of spurious spectral hardening and underestimating the true counting rate by under counting multiple events. These additional effects are grade migration and pulse saturation, both of which can cause distortion of the apparent PSF. Possibly the most troubling effect of pile-up is that the grade distribution for X-ray events may change. The change of grade introduced by pile-up has come to be referred to as "grade migration". Table 6.8 shows an example of grade migration due to pile-up as the incident flux is increased. In this simple test, which involved only mono-energetic photons, the largest effect is the depletion of G0 events and the increase of G7 events. In general, as the incident flux rate increases, the fraction of the total number of events occupying a particular event grade changes as photon-induced charge clouds merge and the resulting detected events "migrate" to other grades which are not at all necessarily included in the standard (G02346) set. If one applies the standard calibration to such data, the true flux will be under-estimated. One consequence of severe instances of pile-up is the creation of a region with no events! In this case, the pile-up is severe enough that the total amplitude of the event is larger than the on-board threshold (typically 13 keV) and is rejected. Holes in the image can also be created by grade migration of events into ACIS grades (e.g. 255) that are filtered on-board. Obviously the effects of pile-up are most severe when the flux is highly concentrated on the detector. Thus, the core of the PSF suffers more from pile-up-induced effects than the wings. Figure 6.21 illustrates this point. Because the core is suppressed, the PSF profile appears less peaked and (apparently) broader than would be the case if pile-up were negligible. It is clearly important in preparing a Chandra observing proposal to determine if the observation will be impacted by pile-up, and if so, to decide what to do about it (or convince the peer review why the specific objective can be accomplished without doing anything). There are two approaches to estimating the impact of pile-up on the investigation. The most sophisticated uses the pile-up models in XSPEC, Sherpa, and ISIS to create a simulated data set which can be analyzed in the same way as real data. A less sophisticated, but very useful, approach is to use the web version of PIMMS to estimate pile-up, or to use Figures 6.21 and 6.22. Figure 6.21: The effects of pile-up on the radial distribution of the PSF are illustrated. These data were taken during ground calibration at the XRCF. The specific "OBSIDs", the counting rate per CCD frame ("c/f"), and the "pile-up fraction" as defined in Section 6.16.2 are given in the inset. Figure 6.22: The pile-up fraction as a function of the the counting rate (in the absence of pile-up in units of photons/frame). The solid line is for on-orbit, the dashed line and the data points are for, and from, ground-based data respectively. The difference between the ground and flight functions are a consequence of the improved PSF on-orbit, where gravitational effects are negligible - see Chapter 4. Note that when pile-up occurs there are two or more photons for each event, so the fraction of events with pile-up is always less than the fraction of photons with pile-up. Figure 6.23: MARX simulations of the effect of pile-up on the shape of the spectrum. The true (solid line) and the detected (dotted line) spectra are shown for four different viewing angles. The corresponding "pile-up fractions" - see Section 6.16.2 - are 46%, 40%, 15%, and 2% as the image is moved progressively further off-axis. Simple Pile-Up Estimates The pile-up fraction is the ratio of the number of detected events that consist of more than one photon to the total number of detected events. An estimate of the pile-up fraction can be determined from Figure 6.22. The algorithm parametrizes the HRMA+ACIS PSF in terms of the fraction of encircled energy that falls within the central 3×3 pixel event detection cell, and assumes that the remaining energy is uniformly distributed among the 8 surrounding 3×3 pixel detection cells. The probabilities of single- and multiple-photon events are calculated separately for the central and surrounding detection cells and subsequently averaged (with appropriate weighting) to obtain the pile-up fraction as a function of the true count rate - the solid line in Figure 6.22. The model was tested against data taken on the ground under controlled conditions - also shown in Figure 6.22. As a general guideline, if the estimated pile-up fraction is > 10%, the proposed observation is very likely to be impacted. The first panel (upper left) in Figure 6.23 qualitatively illustrated the effect on a simulated astrophysical X-ray spectrum. However, the degree of pile-up that is acceptable will depend on the particular scientific goals of the measurement, and there is no clear-cut tolerance level. If one's scientific objective demands precise flux calibration, then the pile-up fraction should probably be kept well below 10%. The PIMMS tool provides the pile-up fraction using the algorithm described here, both for direct observation with ACIS and also for the zeroth-order image when a grating is inserted. John Davis developed an algorithm for modeling the effects of pile-up on ACIS spectral data. The algorithm has been implemented as of XSPEC V11.1 and Sherpa V2.2. The algorithm can be used to attempt to recover the underlying spectrum from a source, or to simulate the effects of pile-up for proposal purposes. The algorithm has been tested by comparing CCD spectra with grating spectra of the same sources. Care should be taken in applying the algorithm - for example, using the appropriate regions for extracting source photons and avoiding line-dominated sources. A description of the algorithm can be found in Davis 2001 (Davis, J.E. 2001, ApJ, 562, 575). Details on using the algorithm in Sherpa are given in a Sherpa "thread" as of CIAO V2.2 on the CXC CIAO web page: http://cxc.harvard.edu/ciao/. We summarize here various methods that can be used to reduce pile-up. By cutting back on CCD exposure time, the probability of pile-up decreases. The user is advised to select the best combination of a subarray and frame time to avoid losing data as discussed in Section 6.13.1. This option simply alternates between exposures that are subject to pile-up and those that are not. The capability was originally developed for use with certain grating observations to allow one to spend some time obtaining useful data from a zeroth order image, which would otherwise be piled up. See Section 6.13.2. If two-dimensional imaging is not required, consider using CC mode (Section 6.13.3). Inserting either the HETG (Chapter 8) or the LETG (Chapter 9) will significantly decrease the counting rate as the efficiency is lower. The counting rate in the zero order image may then be low enough to avoid pile-up. Performing the observation with the source off-axis spreads out the flux and thus decreases the probability of pile-up at the price of a degraded image. Figure 6.23 illustrated the impact. The option is only listed for completeness, the option is not recommended or encouraged. There are three components to the on-orbit background. The first is that due to the cosmic X-ray background (a significant fraction of which resolves into discrete sources during an observation with Chandra). The second component is commonly referred to as the charged particle background. This arises both from charged particles, photons, and other neutral particle interactions that ultimately deposit energy in the instrument. The third component is the "read-out artifact" which is a consequence of the "trailing" of the target image during the CCD read-out; it is discussed in Section 6.13.1. The background rates differ between the BI and the FI chips, in part because of differences in the efficiency for identifying charged particle interactions. Figure 6.24 illustrates why. Figure 6.24: Enlarged view of an area of a FI chip I3 (top) and a BI chip (bottom) after being struck by a charged particle. There is far more "blooming" in the FI image since the chip is thicker. The overlaid 3×3 detection cells indicate that the particle impact on the FI chip produced a number of events, most of which end up as ASCA Grade 7, and are thus rejected with high efficiency. The equivalent event in the BI chip, is much more difficult to distinguish from an ordinary X-ray interaction, and hence the rejection efficiency is lower. Beginning in 2002-Sep and continuing until 2012-Jun, observations have been carried out with the ACIS in the stowed position, shielded from the sky by the SIM structure, and collecting data in normal imaging TE VF mode at -120C. Chips I0, I2, I3, S1, S2, S3 were exposed. The SIM position was chosen so that the on-board calibration source did not illuminate the ACIS chips. This allowed us to characterize the non-celestial contribution to X-ray background (i.e., from charged particles). The resulting spectra from different chips are shown in Figure 6.25. Chip S2 is similar to the ACIS-I chips (denoted I023 in the figure) and not shown for clarity. In addition, in July-September 2001, Chandra performed several short observations of the dark Moon, which blocks the cosmic X-ray background. The dark Moon and stowed background spectra were indistinguishable (except for short periods of flares and variable Oxygen line emission in the Moon observations). We have not observed any background flares in the stowed position. Thus, the ACIS-stowed background is a good representation of the quiescent non-X-ray background in the normal focal position and can be used for science observations. 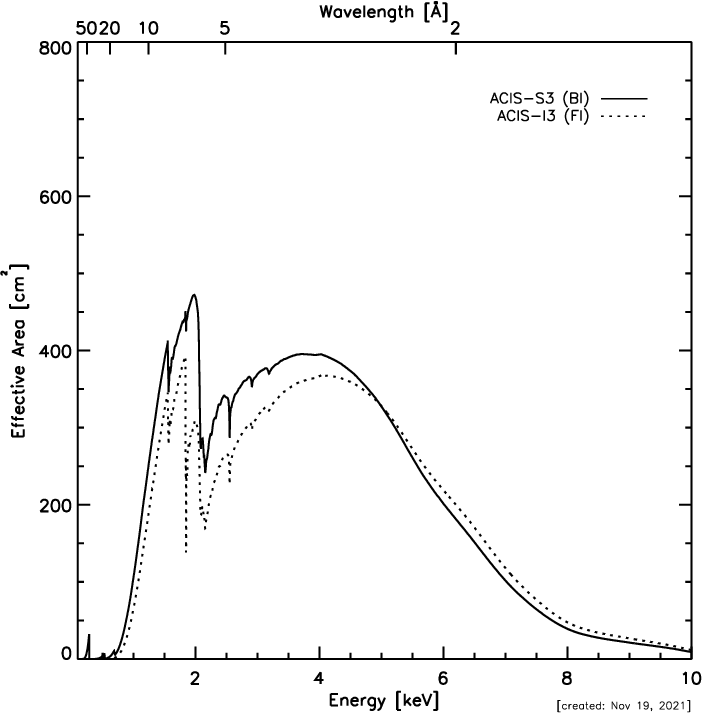 Figure 6.25: Energy spectra of the charged particle ACIS background with ACIS in the stowed position (a 50 ks exposure taken in 2002-Sep; standard grade filtering, no VF filtering). Line features are due to particle-induced fluorescence of material in and surrounding the focal plane. The flight-grade distributions in early measurements of the non-X-ray background for the two types of CCDs are shown in Figure 6.26. Although subsequent to these early measurements the CCD temperature has been lowered and the FI devices suffered the effects of the radiation damage, the background is still dominated by the same grades. Based on these data, events from flight grades 24, 66, 107, 214, and 255 are routinely discarded on-board. The total rate of the discarded events is available in the data stream. The remaining non-X-ray events telemetered to the ground are still dominated (70-95%) by other bad grades. They are not discarded on-board because some of them may turn out to be valid X-ray events after ground processing. For data taken using the Very Faint (VF) telemetry format (Section 6.15.2), the non-X-ray background can be reduced in data processing by screening out events with significant flux in border pixels of the 5×5 event islands. This screening leaves the data from faint sources essentially the same while reducing the FI background at different energies: a factor of 1.4 (E > 6 keV); 1.1 (1−5 keV); and 2 (near ∼ 0.5 keV). For the BI chips the reductions are: 1.25 (E > 6 keV); 1.1 (1−5 keV); and 3 (near 0.3 keV). In addition, the spatial nonuniformity of the non-X-ray background may be reduced by VF screening; see the background uniformity memo at http://cxc.harvard.edu/cal/Acis/detailed_info.html#background. The screening algorithm has been incorporated into the CIAO tool acis_process_events. Further discussion may be found at http://cxc.harvard.edu/cal/Acis/Cal_prods/vfbkgrnd/index.html. Proposers should be aware that telemetry saturation occurs at lower count rates for observations using the VF format, so they may need to take steps to limit the total ACIS count rate (see Section 6.17.2). Proposers should also be aware that if there are bright point sources in the field of view, the screening criterion discussed above is more likely to remove source events due to pile-up of the 5×5 pixel event islands. Point sources should have count rates significantly less than 0.1 cts/sec to be unaffected. However, there is no intrinsic increase of pile-up in VF data compared to Faint mode, and the screening software can be selectively applied to regions, excluding bright point-like sources. Thus the use of VF mode is encouraged whenever possible. Figure 6.26: Fraction of ACIS background events as a function of grade from early in-flight data for an FI chip (S2) (top) and a BI chip (S3) (bottom). In real observations, two more components to the background come into play. The first is the cosmic X-ray background which, for moderately long ( ∼ 100 ks) observations will be mostly resolved into discrete sources (except for the diffuse component below 1 keV) but, nevertheless, contributes to the overall counting rate. The second is a time-variable "flare" component caused by any charged particles that may forward-scatter from the HRMA mirrors and have sufficient momentum so as not to be diverted from the focal plane by the magnets included in the observatory for that purpose, or from secondary particles (Section 6.17.3). Figure 6.27 compares flare-free ACIS-S3 spectra of the non-X-ray (dark Moon) background and a relatively deep pointing to a typical region of the sky away from bright Galactic features. 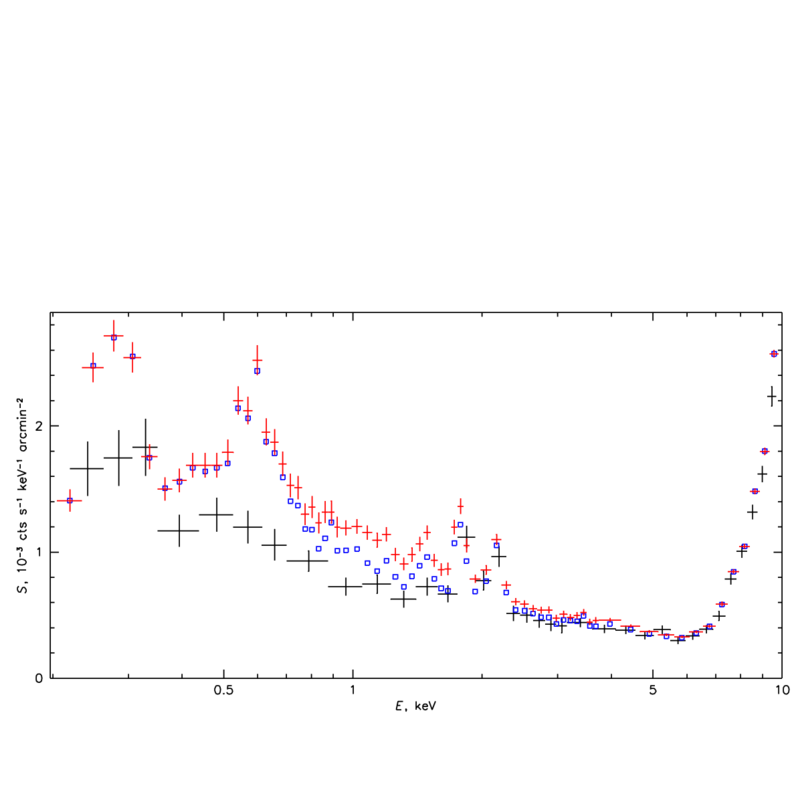 Figure 6.27: ACIS-S3 spectrum of the non-X-ray background (large crosses) overlaid on the quiescent blank sky spectrum. Small crosses show the total sky spectrum, while squares show the diffuse component left after the exclusion of all point sources detectable in this 90 ks exposure. Standard grade filtering and VF filtering are applied. The background and blank-sky spectra are normalized to the same flux in the 10-12 keV band. Estimates for the mid-2016 quiescent detector+sky background counting rates in various energy bands and for the standard good grades are given in Table 6.9. Insertion of the gratings makes little measurable difference in the background rates, but it does block the background flares. The lower-energy rates are very approximate as they vary across the sky. The rates are slowly changing on the timescale of months, so Table 6.9 can only be used for rough sensitivity estimates. Table 6.10 gives total background count rates for each type of chip, including all grades that are telemetered (see Section 6.15.1 and 6.17.1), and can aid in estimating the probability of telemetry saturation. fBeginning in Cycle 11 (late 2009) the default high energy limit was changed from 15 keV to 13 keV. Subsequent 15 keV rate estimates were scaled from 13 keV rates using 13 kev/15 keV conversion factors of 0.82 for S2 and and 0.68 for S3. These factors were determined from observations with fairly constant background rates between 2009-Apr and 2009-Jul when the onboard high energy limit was set either to 15 keV or to 13 keV. The trend in background rates follows approximately the (inverse of) the solar cycle with a lag of about a year; see Figures 6.28 and 9.21. The 2018 rates are ∼ 7% (S3) and ∼ 15% (S2) lower than the 2009 peaks. The pattern suggests in Cycle 21 the rates will likely remain slightly lower than (or comparable to) the 2009 rates. 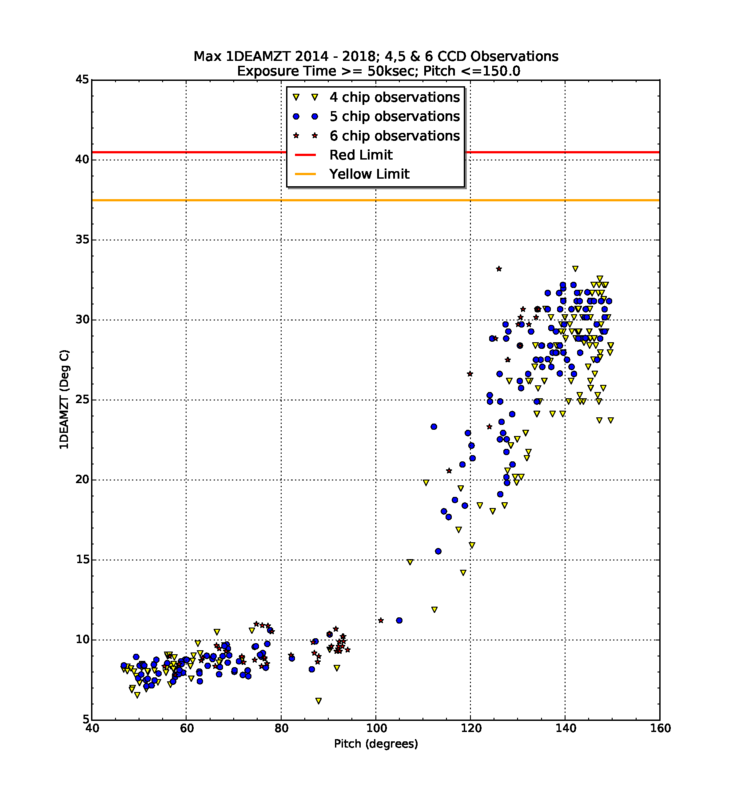 For aid in data analysis and planning background-critical observations, the CXC has combined a number of deep, source-free, flare-free exposures (including all components of the background) into background event files for different time periods. These blank-sky datasets, along with the detector-only (ACIS-stowed) background files (Section 6.17.1), can be found in the CALDB. In general, the background counting rates are stable during an observation. Furthermore, the spectral shape of the non-X-ray background has been remarkably constant during 2000-2018 for FI and, to a lower accuracy, for BI chips, even though the overall background rate showed secular changes by a factor of 1.5. 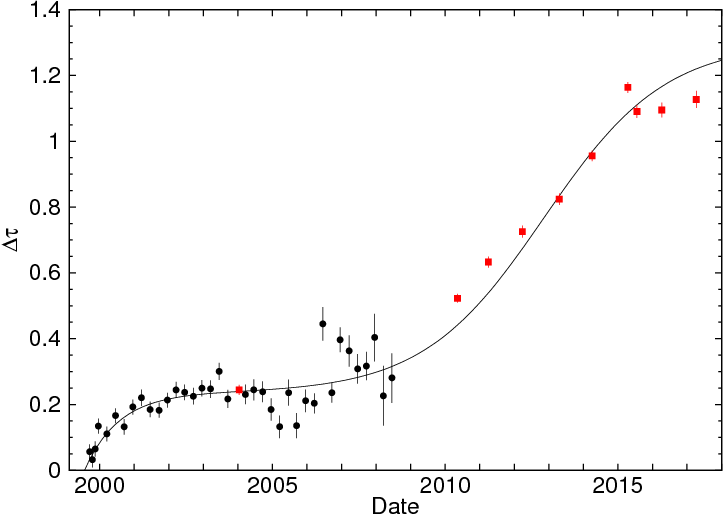 (For chip S3, the shape has been constant during 2000-2005, but a small change has been observed since late 2005.) When the quiescent background spectra from different observations are normalized to the same rate in the 10-12 keV interval, they match each other to within ±3% across the whole Chandra energy band. The previous discussion assumes that the upper threshold is set to 13 keV. 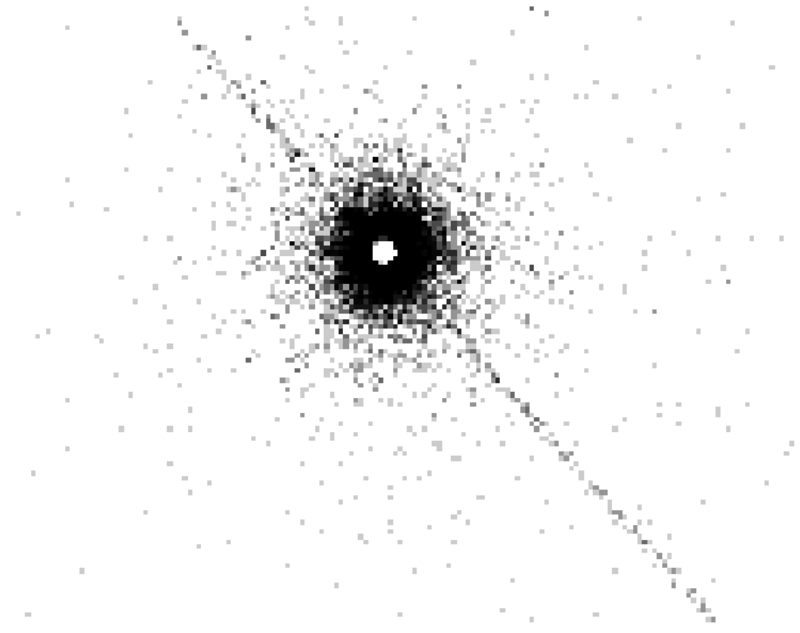 Occasionally, however, there are large variations (flares), as illustrated in Figure 6.29. Figure 6.30 shows the frequency of such variations when compared to the quiescent background. An average fraction of the exposure affected by flares above the filtering threshold used for the blank-sky background datasets (a factor of 1.2 above the nominal rate) was about 6% for FI chips and up to 1/3 for BI chips during the first few years of the mission. The average fraction of exposure affected by flaring has declined with time, and was practically zero for a long stretch. Recently, the flare frequency has been increasing, but at present (late 2018) it has not reached the frequency seen early in the mission. Thus, given that the quiescent background in FI chips is also lower than that in S3, background-critical observations may best be done with ACIS-I. Several types of flares have been identified, including flares that are seen only in the BI chips, and flares that are seen in both the FI and BI chips. Figure 6.31 shows the spectra of two of the most common flare species. Both flares have spectra significantly different from the quiescent background. In addition, the BI flares have spatial distribution very different from that of the quiescent background. The BI flares produce the same spectra in S1 and S3. Users should note that the total counting rate can significantly increase during a flare (although flare events are almost exclusively good-grade so the total rate does not increase by as large a factor as the good-grade rate; details can be found at http://cxc.harvard.edu/cal/Acis/Cal_prods/bkgrnd/current). If the probability of telemetry saturation is significant, users of ACIS-I might consider turning off the S3 chip. However, if ACIS-S is used in imaging mode, and flaring is a concern, the CXC recommends that both BI chips be turned on if thermal constraints permit (see Sections 6.20 and 6.22). The advantage is that for most types of flares S1 can be used to determine the flare spectrum which can then be subtracted from the spectrum obtained with S3. Figure 6.29: An example of the ACIS background counting rate versus time - BI chip (S3; top curve) and an FI chip (I2; bottom curve). These are for the standard grades and the band from 0.3 - 10 keV. Figure 6.30: An estimate of the cumulative probability that the ratio of the background counting rate to the quiescent background counting rate is larger than a given value. Upper plot for a representative FI chip - S2, and the lower curve for a representative BI chip - S3. The vertical dotted line is a limiting factor 1.2 used in creating the background data sets. These probabilities are relevant for the archival data from the first 2-3 years of the mission. After declining with time to almost zero for a number of years, the amount of flaring has increased as we approach the solar maximum, but there is less flaring than was seen in the first few years of the mission. 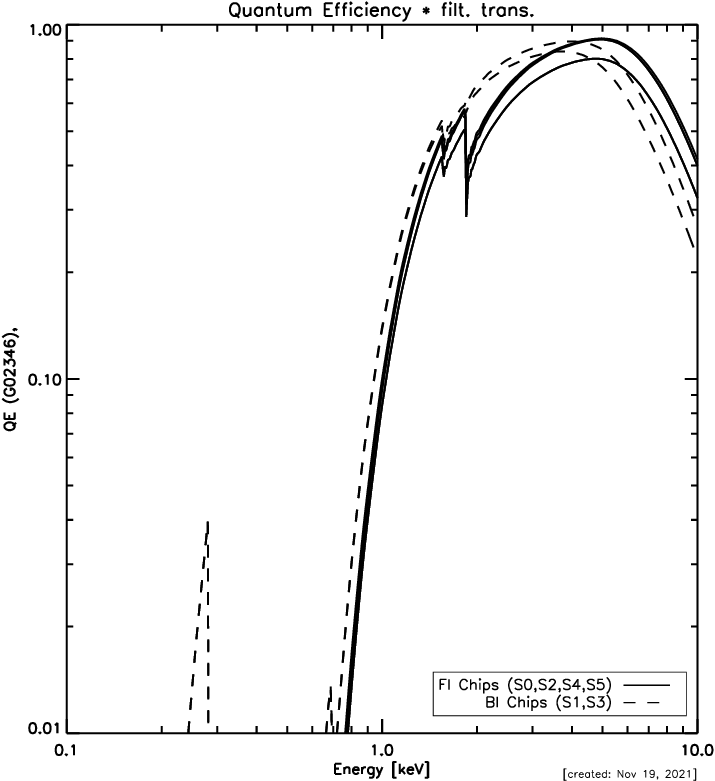 Figure 6.31: Spectra of different background flares in chip S3. Thick crosses show a common flare species that affects only the BI chips. Thin crosses show one of the several less common flare species that affect both the BI and FI chips. Note how both these spectra are different from the quiescent spectrum (see Figure 6.27). Apart from compressing the data into one dimension (Section 6.13.3), there is essentially no difference in the total background in CC mode and that encountered in the timed exposure mode. The background per-sky-pixel, however, will be 1024 times larger, since the sky-pixel is now 1 × 1024 ACIS pixels. The sensitivity for detecting objects is best estimated using the various proposal tools such as PIMMS, MARX, etc. The "Chandra Proposal Threads" web page gives detailed examples of how to use these tools (http://cxc.harvard.edu/proposer/threads). Pre-Flight radiation tests have shown that ∼ 200 krads of X-ray photon dose will damage the CCDs. The mechanism for the damage is the trapped ionization in the dielectric silicon oxide and nitride separating the gates from the depletion region. Since the charge is trapped, the damage is cumulative. Because the structure of the BI CCDs differs significantly from that of the FI CCDs, the two types of chips have different photon dose limitations. Specifically, the BI CCDs are more than 25 times as tolerant to a dose of X-ray photons as compared to the FI CCDs since the former have ∼ 40 μm of bulk Si protecting the gate layer. Simulations of astrophysical sources have yielded a very conservative, spectrally-averaged, correspondence of 100 cts/pix = 1 rad. By `counts' in this context we mean all photons that impinged on the detector, whether or not they were piled-up or discarded on-board. If your observation calls for observing a bright point-like source close to on-axis, we suggest you use the MARX simulator (with the parameter DetIdeal=yes & dither, typically, on) to calculate whether your observation may reach 1% of the above mission limits in any one pixel. If so, please contact the CXC HelpDesk (http://cxc.harvard.edu/helpdesk/) to custom design an observational strategy which may accommodate your science aims, while maintaining the health & safety of the instrument. Many of the spacecraft components have been reaching higher temperatures over the course of the mission because of changes in the insulating layers on the exterior surfaces of the Chandra spacecraft. The ACIS electronics and Focal Plane (FP) temperatures can reach their operational limits depending on the orientation of the spacecraft and the number of operating CCDs. The number of operating CCDs and/or the duration of observations is limited for observations with solar pitch angles less than 60° and solar pitch angles greater than 130°. Starting in Cycle 21, the proposal submission software will allow the GO to specify a maximum of 4 required CCDs. If a 5th and/or 6th CCD are desired by the GO, they must be specified as optional at the time of proposal submission. This restriction is made necessary due to the difficulty in meeting the thermal constraints, further details are provided in the next section (Section 6.20.1). Please note that the solar pitch angles specified here, while they correspond to the pitch range boundaries given in other CXC documents, are practical representations of more complex physical behavior and should be understood as approximate. 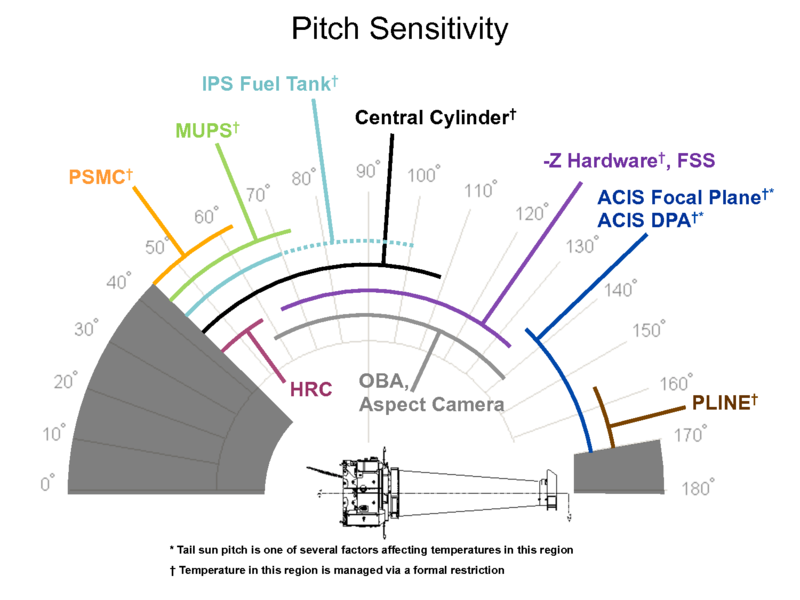 Several components on the Chandra spacecraft have reached elevated temperatures at a variety of pitch angles. Figure 6.32 displays approximate pitch ranges and the components sensitive in those ranges. Within ACIS, the Power Supply and Mechanism Controller (PSMC) heats at pitch angles less than 60° and the Focal Plane (FP), Detector Electronics Assembly (DEA), and Digital Processing Assembly (DPA) heat at angles larger than 130°. Under current conditions, and assuming an initial PSMC temperature of less than +30 C, observations at pitch angles less than about 60°, longer than 50 ks, and with 6 CCDs operating are likely to approach or exceed the PSMC thermal limit (Figure 6.33). Likewise observations at pitch angles larger than about 130°, longer than about 50 ks, and with 5 or 6 CCDs operating are likely to approach or exceed the DPA and DEA thermal limits (Figures 6.34 and 6.35). Finally, the ACIS FP temperature will increase above the desired operating temperature of -119.7 C for observations with pitch angles larger than 130°. Each of these temperatures can be reduced by reducing the number of operating CCDs. The Operations team may turn off one, two, or three optional CCDs if a total of 4-6 CCDs are selected (where "total" means the sum of required plus optional CCDs; see section 6.22.1) if the thermal models indicate that operational limits might be reached for a given observation. For these reasons, observations with 4 or fewer CCDs are becoming more common, while observations with 5 or 6 CCDs are becoming less common. Figure 6.33 illustrates the increase in PSMC temperature for observations at low pitch angles. Observations using 6 chips are plotted as red stars, 5 chips as blue circles and 4 chips as yellow triangles. Variations in the maximum temperature at a particular pitch angle and chipset correspond primarily to variations in the starting temperatures for the observations. The yellow and red lines indicate the yellow and red limits for the PSMC temperature. It is evident from Figure 6.33 that using one fewer CCD can reduce the temperature by a few degrees, thus allowing somewhat longer observations to be carried out at low pitch angles. In tail-Sun orientations (pitch angles larger than 130°), the ACIS FP temperature, the DEA temperature, and the DPA temperature can warm outside of the desired range. Each of these three temperatures can be reduced by reducing the number of CCDs being clocked. Figure 6.34 displays the DPA temperature as a function of pitch angle for 4, 5, and 6 CCD configurations, and Figure 6.35 shows the corresponding data for the DEA. The PSMC temperature has been controlled since 2008 through the use of a model which predicts the temperature for a given week, given the mix and timing of observations. The DPA temperature has been controlled since 2012 via a similar thermal model. If the predicted temperatures exceed the planning limits, adjustments are made such as turning off one or more optional CCDs, splitting an observation, or rescheduling an observation at a more favorable pitch angle. 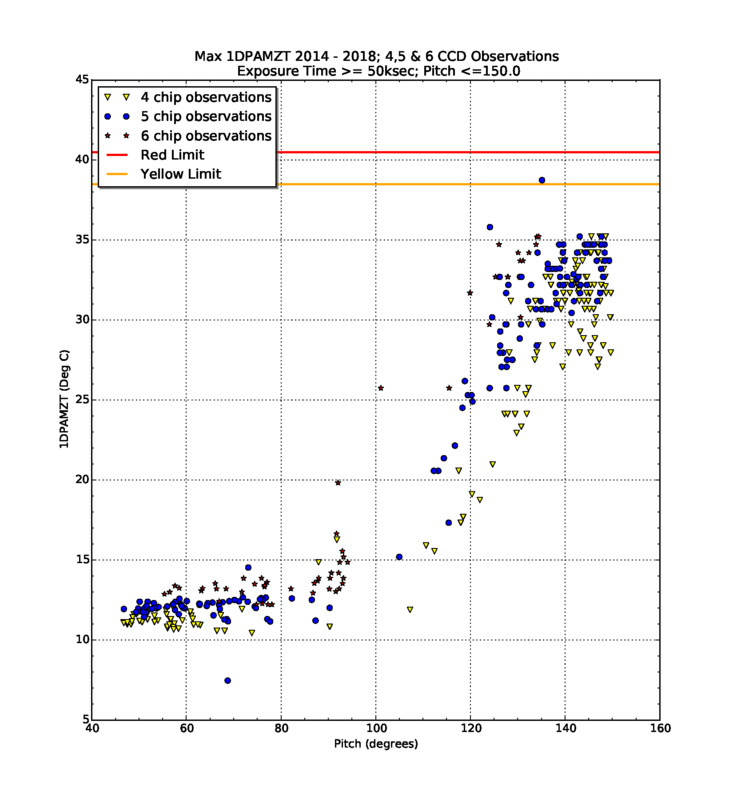 It is also clear that 6 CCD observations were less common in the period from 2014 to 2018, and that 6 CCD observations at pitch angles less than 50° and longer than 50 ks are likely to exceed the PSMC yellow high limit. Given the increasing trend in maximum temperatures, it is also expected that all observations longer than 50 ks with a pitch angle larger than 135° will need to be executed with 4 or fewer CCDs from 2019 onwards. Figure 6.33: ACIS PSMC temperature as a function of spacecraft pitch angle. 6 CCD observations are indicated by red stars, 5 CCD observations by blue circles and 4 CCD observations are indicated by yellow triangles. Figure 6.34: DPA temperature as a function of spacecraft pitch angle. 6 CCD observations are indicated by red stars, 5 CCD observations by blue circles and 4 CCD observations are indicated by yellow triangles. Figure 6.35: DEA temperature as a function of spacecraft pitch angle. 6 CCD observations are indicated by red stars, 5 CCD observations by blue circles and 4 CCD observations are indicated by yellow triangles. Chandra has successfully observed several solar system objects, including Venus, the Moon, Mars, Jupiter and several comets. Observations of planets and other solar system objects are complicated because these objects move across the celestial sphere during an observation and the optical light from the source can produce a significant amount of charge on the detectors (this is primarily an issue for ACIS-S observations). Some information regarding observation planning and data processing is given here. Users are encouraged to contact the CXC for more detailed help. Chandra cannot observe the Sun for obvious reasons. Chandra has conducted observations of the Moon earlier in the mission, but observations of the Moon with ACIS are currently not allowed. The concern is that the bright flux of optical and UV photons could potentially polymerize the contaminant on the ACIS filters. Observations of the dark portion of the Moon are not allowed since there is a risk that the Sun-illuminated portion of the Moon might encroach upon the FOV during the observation. For similar reasons, ACIS observations of the Earth (including the dark portion) are not allowed. See Section 3.3.2 in Chapter 3 and Chapter 5 for further discussion on avoidances and constraints. Any solar system object other than the Sun, the Earth, the Moon, and Mercury can be observed with ACIS-I, subject to the avoidances discussed in Section 3.3.2 and Chapter 5. Previous solar system observations with ACIS-I have not revealed significant contamination from optical light. However, proposers are encouraged to work with the CXC when planning the specifics of a given observation. Since the source moves across the celestial sphere in time, an image of the event data will exhibit a "streak" associated with the source. The CIAO tool sso_freeze can be used to produce an event data file with the motion of the source removed. Any solar system object other than the Sun, the Earth, the Moon, and Mercury can be observed with ACIS-S, subject to the avoidances discussed in Section 3.3.2 and Chapter 5. The ACIS-S array can be used with or without a grating. The BI CCDs are more sensitive to soft X-rays than the ACIS-I array CCDs, but the entire ACIS-S array suffers from the disadvantage that its OBF is thinner than for ACIS-I and may transmit a non-negligible flux of visible light onto the CCDs. It is thus necessary to estimate the amount of charge produced in the CCDs due to the optical light. More detailed information can be found at http://cxc.harvard.edu/cal/Hrma/UvIrPSF.html and from the CXC via HelpDesk (http://cxc.harvard.edu/helpdesk/). If the optical light leak is small enough, it can be mitigated by simply shortening the frame time. This leads to a linear drop in the number of ADU due to optical light. If possible, VF mode should be used, since in this mode the outer 16 pixels of the 5×5 region allows a "local" bias to be subtracted from the event to correct for any possible light leakage. However, see the warnings in Section 6.15.2. The optical light also invalidates the bias taken at the beginning of the observation if a bright planet is in the field. It is therefore desirable to take a bias frame with the source out of the field of view. This bias map is useful even when processing 5×5 pixels in VF mode since it can be employed as a correction to the local average "bias" computed from the 16 outer pixels, thereby correcting for hot pixels, cosmetic defects etc. A more sophisticated approach to dealing with excess charge due to optical light is to make an adjustment to the event and split thresholds. Event grades are described in more detail in Section 6.15.1. Excess charge (in ADU) due to optical light will be added to the event and split counters on-board. Without an adjustment to the thresholds (or a large enough threshold), many of the X-ray events may have all nine pixels of a 3×3 pixel event detection cell above the split threshold, in which case the event will not be telemetered to the ground. If the adjustment is too large, X-ray events may not be detected because they may not exceed the event threshold. Users should be aware that if the detection thresholds are adjusted, standard CXC processing of planetary data will give inaccurate estimates of event pulse heights and grades. To analyze such data, a thorough understanding of the energy calibration process and manual massaging of the data will be required. This section describes the various inputs that either must be, or can be, specified to perform observations with ACIS. The subsections are organized to match the RPS form. We have added some discussion as to some of the implications of the possible choices. As emphasized at the beginning of the Chapter, ACIS is moderately complex and the specific characteristics of the CCDs and their configuration in the instrument lead to a number of alternatives for accomplishing a specific objective - detailed trade-offs are the responsibility of the observer. For example, it might seem obvious that observations of a faint point source may be best accomplished by selecting the ACIS-S array with the aim point on S3, the BI device that can be placed at the best focus of the telescope, and the CCD with the best average energy resolution. On the other hand, perhaps the science is better served by offset pointing (by a few arcmin) the target onto S2, very near to the frame store, where the FI energy resolution is better than that of S3. Or, if the object is very faint - so that the number total number of photons expected is just a handful (not enough to perform any significant spectroscopy) - the advantage of S3 may not be so obvious considering the smaller field of view and its higher background rate, and perhaps the ACIS-I array, which would optimize the angular resolution over a larger field, may be more attractive. Some ACIS input parameters must be specified: the number and identity of the CCDs to be used, the Exposure Mode, and the Event Telemetry Format. If pile-up and telemetry saturation are not considered to be a problem for the observation, then these are the only parameters that need to be specified. Number and Choice of CCDs The RPS requires the observer to specify the desired aimpoint and to identify the CCDs they want to use. There has been a change in policy concerning the number of CCDs that may be simultaneously operated. Prior to Cycle 13, we encouraged the use of 6 CCDs to facilitate serendipitous detections. Starting in Cycle 20, the RPS allows the GO to specify a maximum of four required CCDs for thermal reasons. If 4 CCDs are specified as required, the GO may specify 1 or 2 optional CCDs to bring the total of required plus optional CCDs to 5 or 6 CCDs, but the GO should be aware that optional CCDs may be turned off once the thermal environment is known at the time the short term schedule is generated. If the science objectives of the proposal require 5 or 6 CCDs, the GO may work with their Uplink Support Scientist after the proposal is selected to specify the 5th or 6th CCD as required. 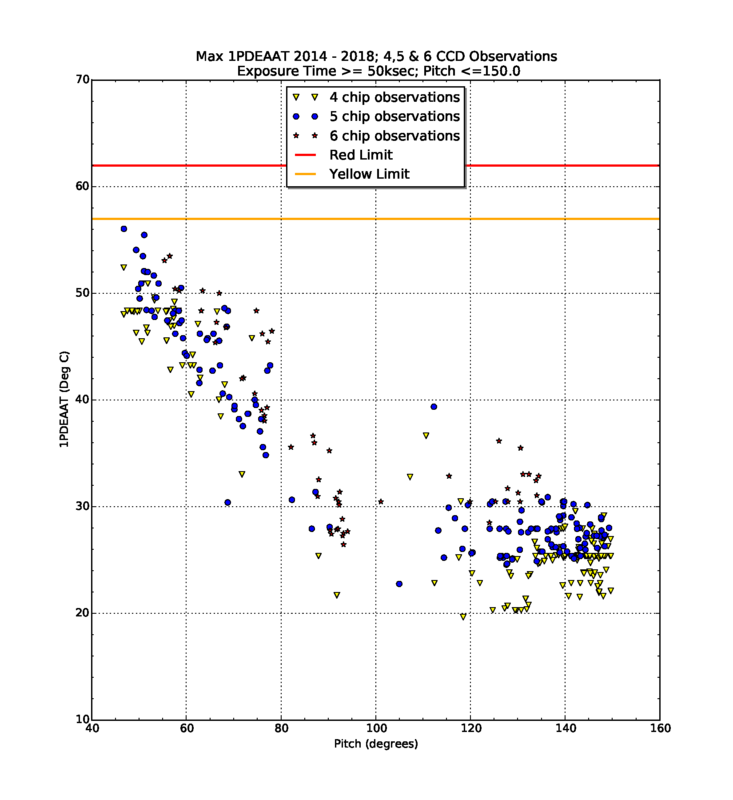 But GOs should be aware that 5 or 6 CCD observations are more difficult to schedule and are likely to be split into multiple observations if the exposure is long. Using fewer than 5 CCDs is beneficial in keeping ACIS Power Supply Mechanism Controller (PSMC) and the ACIS focal plane (FP) and electronics temperatures within the required operating ranges. See Section 6.20 for further information on thermal limitations for ACIS and the number of operating CCDs. If the observer requires the optimal spectral response and most accurate gain calibration (provided by a cold and stable focal plane temperature), they may wish to select a total of 4 or fewer CCDs. For example, if the observer is using the ACIS-I array for imaging, they could select just the four I-array CCDs. If the observer is using S3 for imaging, they could select just S2, S3, S4, and I3, or they could select just S1, S2, S3, and S4. How choices are designated in the RPS form is discussed in the next subsection. Choosing Optional CCDs & Optional CCD Policy The observer may specify that a given CCD must be on for an observation by entering "Y" for that CCD at the appropriate place in the RPS form. If there are CCDs that the observer does not require for their science, they should enter "N". If there are CCDs that the observer would prefer to have turned on should thermal conditions allow it, the rank-ordered designations "Off1", "Off2", up to "Off5" should be used. The CCD designated as "Off1" would be the first one to be turned off, and the CCD designated as "Off5" would be the last that would be turned off. Even if the science requires 5 or 6 CCDs, the observer should set the designation for the 4 most useful as "Y" and the least useful CCD(s) to "Off1" ("Off2"). The proposer should also add a comment in the RPS form that 5 or 6 CCDs are required for the science. If the proposal is accepted, the observer may work with their User Uplink Support Scientist to change "Off1" ("Off2") to 'Y'. The CXC will make its best effort to try to schedule the observation under the appropriate thermal conditions. Note that this scheduling is complicated, might require breaking the observation into separate pointings, and may be impossible to accomplish. The observer should discuss the configuration with Uplink Support and, if there are difficulties in assessing which CCDs should be optional, please contact the CXC HelpDesk (http://cxc.harvard.edu/helpdesk/). Should it be possible to accommodate the observer's request for 5 or 6 CCDs, the observation will most likely take place at solar pitch angles between about 60° and 130°. Some Recommended Chip Sets Observers should specify the chip set that is best for their primary science. The following suggestions have proven to be popular, and would facilitate a more useful and homogeneous archive. Given the current thermal performance of the spacecraft, it is possible that an optional CCD would be turned off. The rationale for the first ACIS-I imaging configuration (Figure 6.36) is that, in the unlikely event of major background flares, telemetry might saturate more rapidly if S3 were on and the focal-plane temperature and electronics temperatures will be lower with only 4 or 5 CCDs on. In addition, since S2 is further from the ACIS-I aimpoint on I3, data on S2 may provide nearby local (FI) background if the target is diffuse emission which does not extend as far as S2. For the second ACIS-I imaging configuration (Figure 6.37), the rationale is that S3 is generally more sensitive and closer to the ACIS-I aimpoint, and so more sensitive to serendipitous source detection. The rationale for the third ACIS-I imaging configuration (Figure 6.38) is that it is desired to have both S2 and S3 on, but it is not required. Given the current thermal performance of the spacecraft, it is probable that one or both optional CCDs would be turned off. If thermal conditions require optional CCDs to be turned off, the CCD specified "OFF1" would be the first to be turned off. For deciding on chipsets for ACIS-S imaging, several factors come into play. In general, chips closest to the S3 aimpoint would be selected as required, while those farthest from the aimpoint (where the PSF is degraded) would selected as optional, and be turned off first if necessary. Given the current thermal performance of the spacecraft, it is possible that one or two optional CCDs would be turned off. The rationale for the first ACIS-S imaging configuration (Figure 6.39) is that S1 will have a higher count rate than an FI CCD in the event of a background flare and thus it might be desirable to turn S1 off. The rationale for the second ACIS-S imaging configuration (Figure 6.40) is that the observer may want to use S1 to model the background on S3, and it is desirable to have S4 turned off. S4 also has has significant noise streaks with resulting decreased sensitivity. so some users may prefer to specify I2 as optional instead of S4. The rational for the third ACIS-S imaging configuration (Figure 6.41 is that it is desirable to have 6 CCDs on, but not required. Given the current thermal performance of the spacecraft, it is probable that one or two optional CCD would be turned off. The optimum ACIS-S spectroscopy chip set depends strongly on the expected spectrum of the target. Typically the maximum signal is desired, so the HETG and LETG observer is most likely to insist on all ACIS-S chips. If the science does depend strongly on the flux received on the S0 and S5 CCDs, the observer may need to specify all 6 ACIS-S CCDs to be on (see Figure 6.42). However, the observer should be aware that the amount of useful flux on S0 and S5 with the LETG is typically quite low given they are both FI CCDs (see Figure 9.6). Given the current thermal performance of the spacecraft, it is probable that one or two optional CCDs would be turned off. We want to know the maximum number of counts in the spectrum from the brightest source the proposer will be analyzing in the field (not necessarily the target), and if the proposer believes that there will be lines in the spectrum from this source. Both questions are being asked to trigger assessment by the CXC of the sensitivity of the experiment to the gain calibration and so that appropriate scheduling may be employed to avoid thermally-induced gain drifts that might impact the observation. If the GO is interested in the optimal spectral performance of the ACIS CCDs, they should seriously consider using only 4 CCDs as discussed above. Optional Parameters that affect Pile-Up See Section 6.13.1 for information on how the selection of the number of operating CCDs and the size and position of the subarray affects the minimum frame time. In general, using fewer CCDs will permit a faster read-out. For example, using the smallest subarray of 128 rows in the middle of the CCD has a minimum frame time of 0.4s with 1 CCD operating and a minimum frame time of 0.7s with 6 CCDs operating. In almost all cases, the observer should leave the parameter on the RPS target form that asks if the most efficient frame time should be used at the default value of "Y". This parameter should be changed only if the observer fully understands the impact on efficiency of their observation. Please contact the CXC HelpDesk (http://cxc.harvard.edu/helpdesk/) if you are considering a non-default setting and are unsure of the CCD selection and CCD Frame exposure time to use. There are only two choices: Timed Exposure (TE) mode (see Section 6.13.1) or Continuous Clocking (CC) mode (see Section 6.13.3). Frame times and efficiencies in TE mode are discussed in Section 6.13.1, and the Alternating Exposure option is discussed in Section 6.13.2. It is possible to remove events from the telemetry stream, and thus avoid telemetry saturation, by specifying an energy acceptance filter within which detected events will be telemetered. The default discards events above 3250 ADU (nominally 13 keV). The total per-chip background rates for different upper energy cut-offs are in Table 6.10. Starting September 2006, a new energy to PHA conversion is used for observations with energy filters. Two sets of conversions are used, depending on the aimpoint of the observation. Observations with ACIS-S at the aimpoint use a conversion tailored for the BI CCDs and those with ACIS-I at the aimpoint use FI CCD-specific conversions. The BI and FI specific conversions are more accurate for each type of CCD than the conversion used in previous cycles. The assumption is that it is desirable to have the most accurate gain conversion for the CCD on which the HRMA default aimpoint falls. Note that the conversion only impacts the on-orbit energy filtering. Ground data processing will always apply the appropriate PHA to energy conversion. The observer should be aware that for observations which mix CCD types (i.e. both BI and FI CCDs on), the selected conversion (based on aimpoint as above), will nevertheless apply to all selected CCDs. This will not affect the observation if the low energy threshold for the energy filter (the "Event filter: Lower" parameter) is 0.5 keV or less, as the use of either conversion at these energies results in essentially no difference in the number of accepted events. However, for selection of a low energy threshold above 0.5 keV, the conversions are significantly different. Finally, observations which apply an energy filter with a low energy threshold greater than 0.5 keV will automatically be assigned spatial windows that allow the FI CCDs to use the FI conversion and the BI CCDs to use the BI conversion regardless of aimpoint. Proposers who need an energy filter lower limit above 0.5 keV are encouraged to contact the CXC HelpDesk (http://cxc.harvard.edu/helpdesk/) to discuss their plans with an instrument scientist. A more sophisticated approach to removing data from the telemetry stream, and thus avoiding telemetry saturation, is by the use of a Spatial Window. This option offers a good deal of flexibility. One may define up to 6 Spatial Windows per CCD. Each window can be placed anywhere on the chip. Note there is a significant difference between a Spatial Window and a Subarray (Section 6.13.1): Subarrays affect the transmission of CCD data to the on-board ACIS processors; Spatial Windows select events detected by the processors and only impact the telemetry rate. The user may also specify the window energy threshold and energy range. Spatial windows can specify the sample rate for events inside them. A sample rate of 0 excludes all events; the default rate of 1 includes all events; a rate of n > 1 telemeters one out of every n events in the window. A spatial window could be used to eliminate a bright, off-axis source that would otherwise overwhelm the telemetry stream. The order in which the spatial windows is specified is important if they overlap. The first specified window which includes a given pixel will be applied to events at that pixel. There are a small number of additional parameters that need to be considered in specifying an observation with ACIS: (1) the off-axis pointing (if required), which reduces the flux, and spreads out the image; (2) the roll angle (Chapter 4); (3) time constraints (if any); and (4) time monitoring intervals (if any). 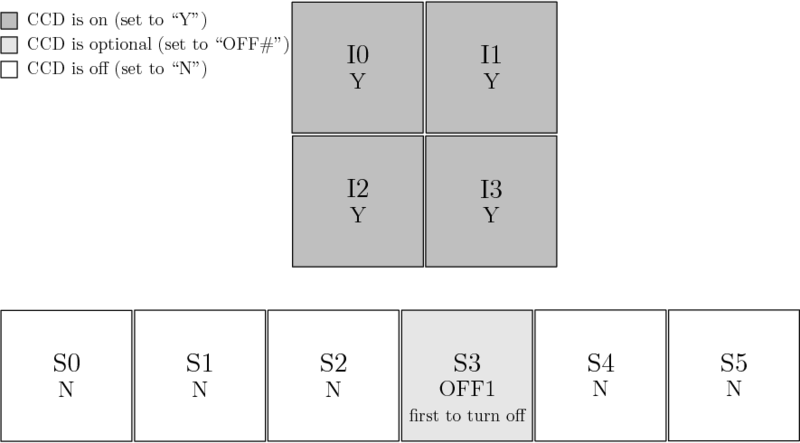 In the past, the Continuous Clocking (CC) mode (see Section 6.13.3) has been used to mitigate pile-up in very bright sources (see Section 6.16.2). ACIS has offered two standard telemetry formats for observations performed in CC mode, "faint" and "graded" (see Section 6.15.2). While the CC faint mode choice has been used on occasion, the CC graded mode has been employed for over 2 Msec of Chandra observing time, primarily to accommodate HETG spectra of bright X-ray binaries. The objective was to use CC mode to mitigate pile-up and conserve discrete structures such as emission and absorption lines, and edges in the dispersed spectrum. CC graded mode also reduces the possibility of telemetry saturation. The calibrations of TE and CC modes are very similar and we have found only small differences with respect to ACIS gain, response, and integrated grade distribution, with CC faint mode versus CC graded mode choice resulting in less than 3% differences at the most. We have developed methods to assist the calibration in CC graded mode in some rare cases. Starting in 2009-Nov, the CC faint and graded modes have been altered to include some of the flight grades that were previously rejected on-board: ACIS now telemeters all flight grades except 24, 107, 127, 214, 223, 248, 251, 254, and 255. While in faint mode these grades are already recognized in the data processing, they will be accounted for in the next CIAO release. It is recommended to use graded mode only in extreme cases. 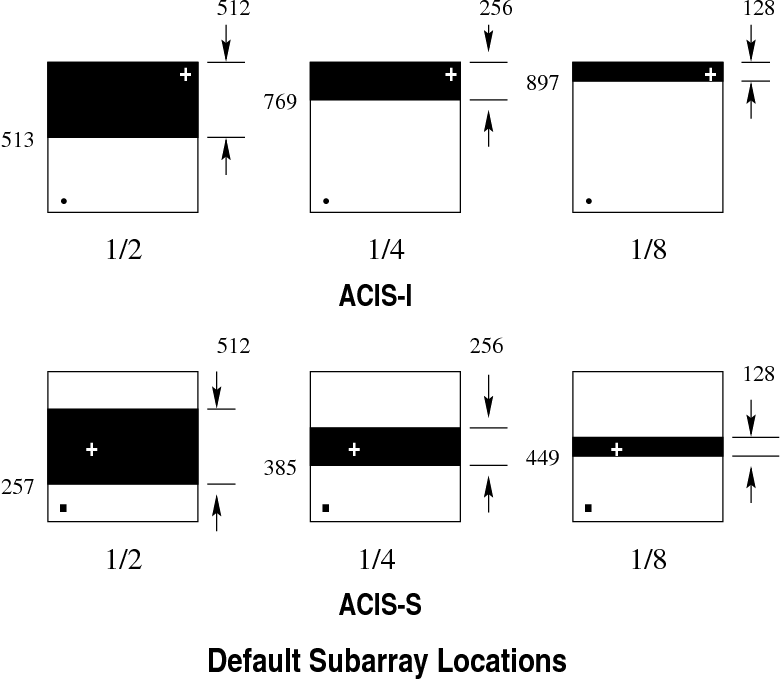 See Section 8.5.1 in Chapter 8 for recommended ACIS modes, CCD choices, subarrays, etc. ; that section also discusses some aspects of analyzing the data.